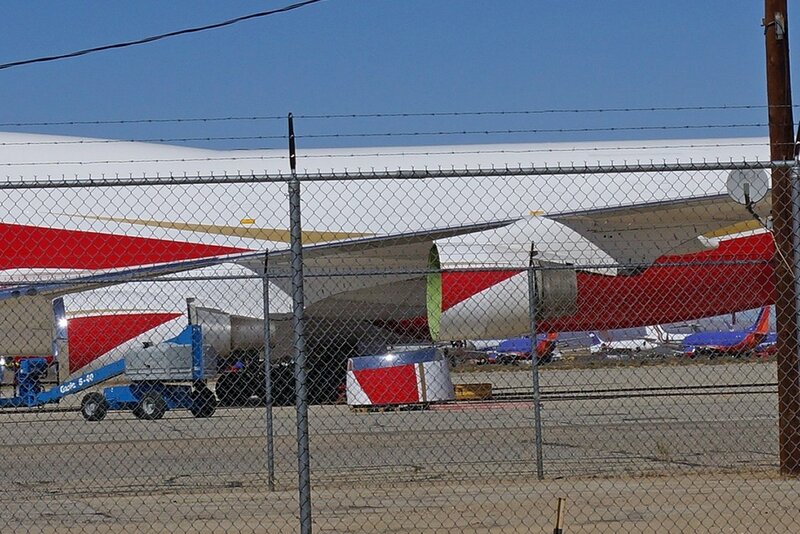 Gary G. Gray (GGG), Marc Fournier (MF). For bigger size photos - please click on the 3- or 4-digit number below each photo. 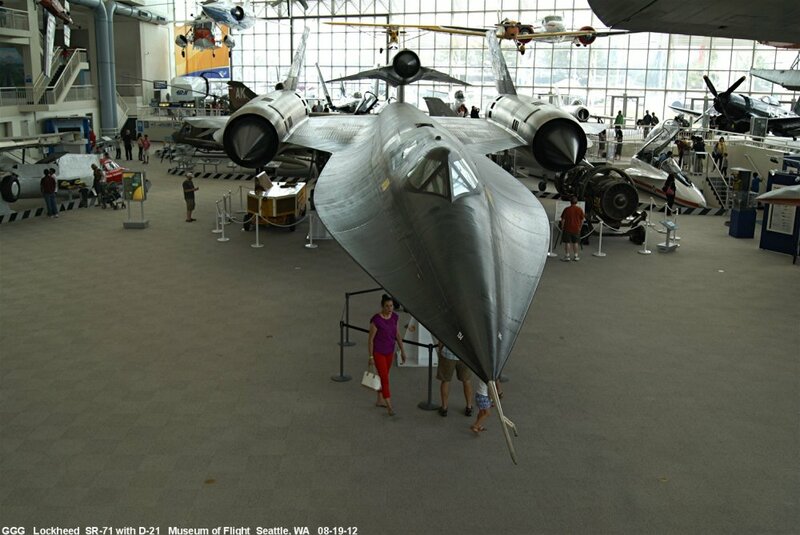 Last week (2/25/10), we enjoyed a great visit from our Kiwi friends Robin and Rhonda Scanes, New Zealand. 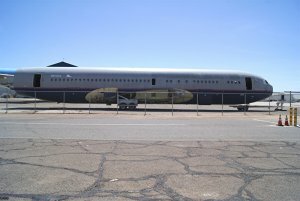 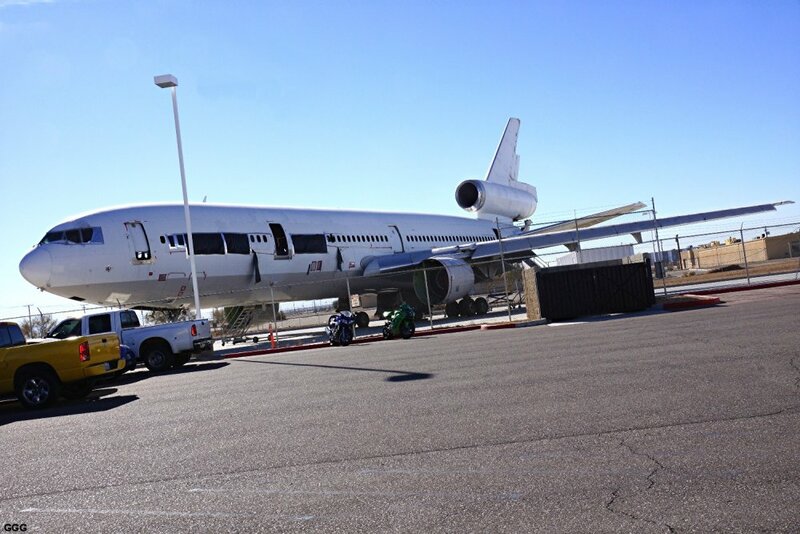 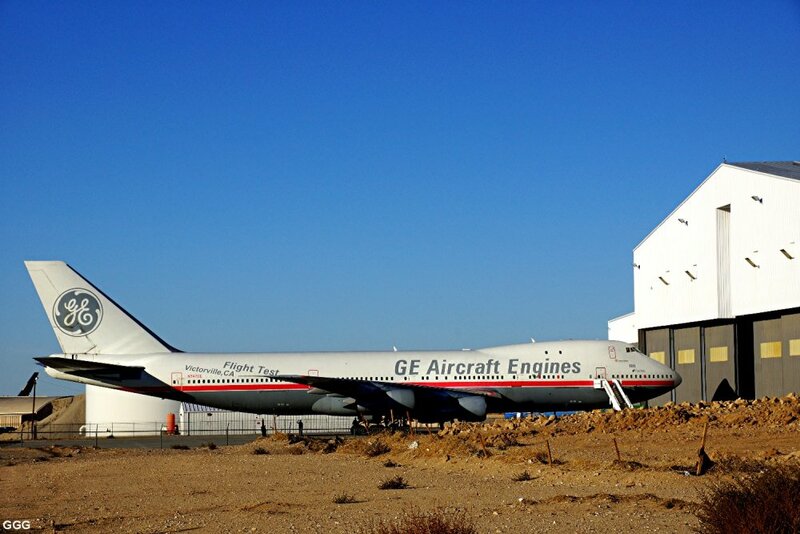 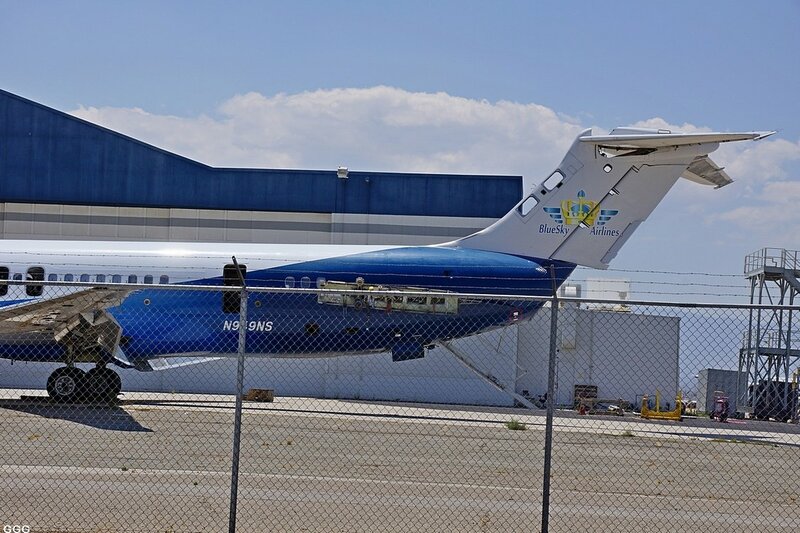 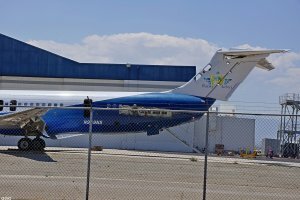 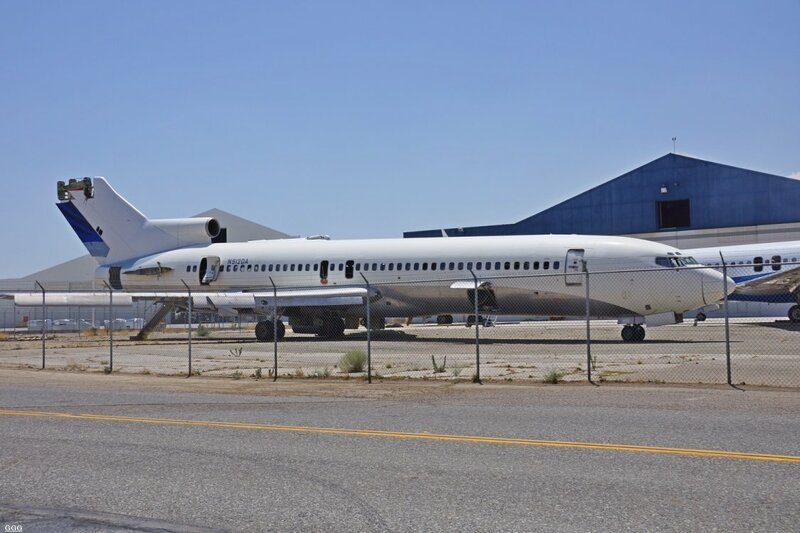 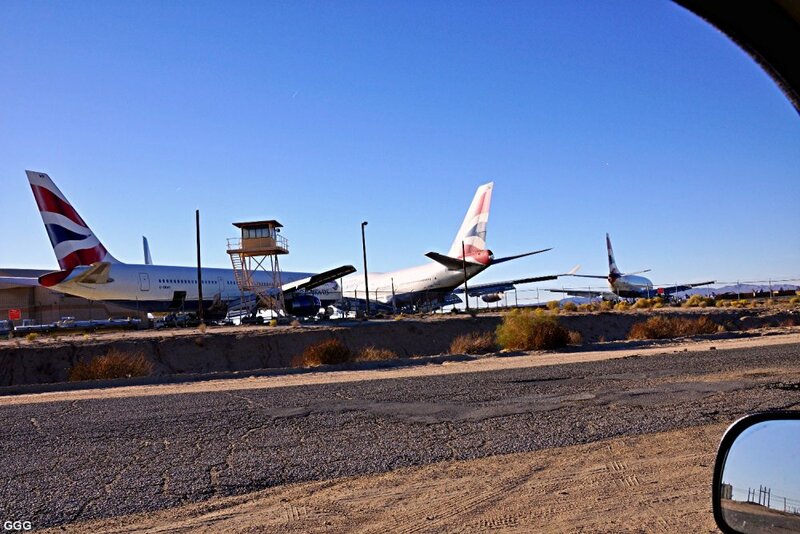 Along with chasing trains from Vegas to Cajon, we took time to check out the airliner "bone yard" at Southern CA Logistics Airport/George AFB. 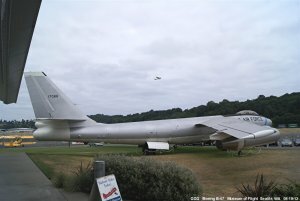 So, here are the first pictures of my/our old base. 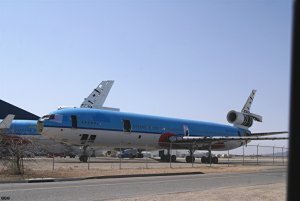 The DC-10's and L-1011's will surely never fly again. 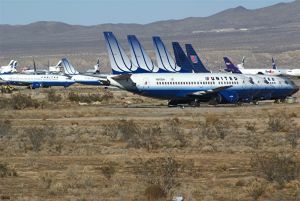 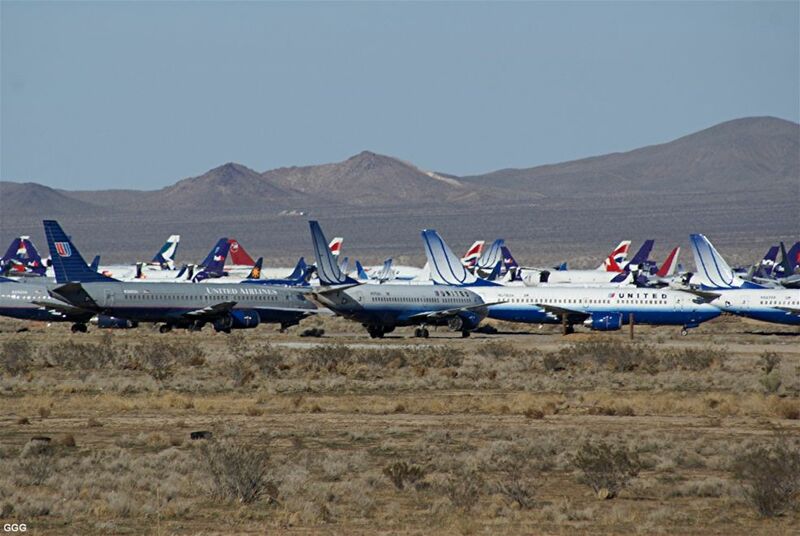 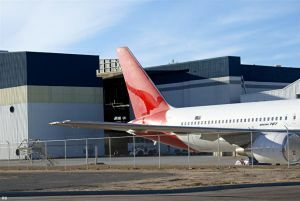 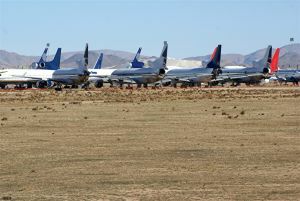 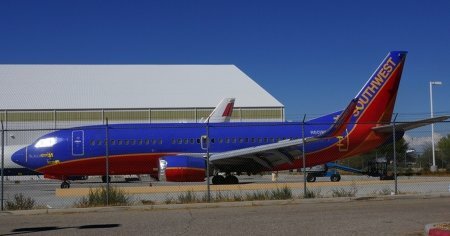 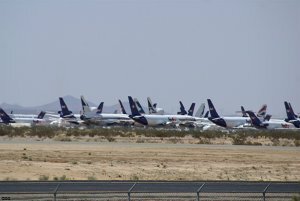 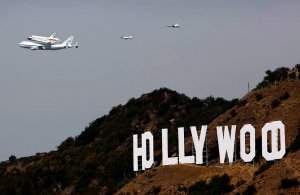 I read in Aviation Week that UAL retired all of their 737's and it appears that they are mostly at SCLA. 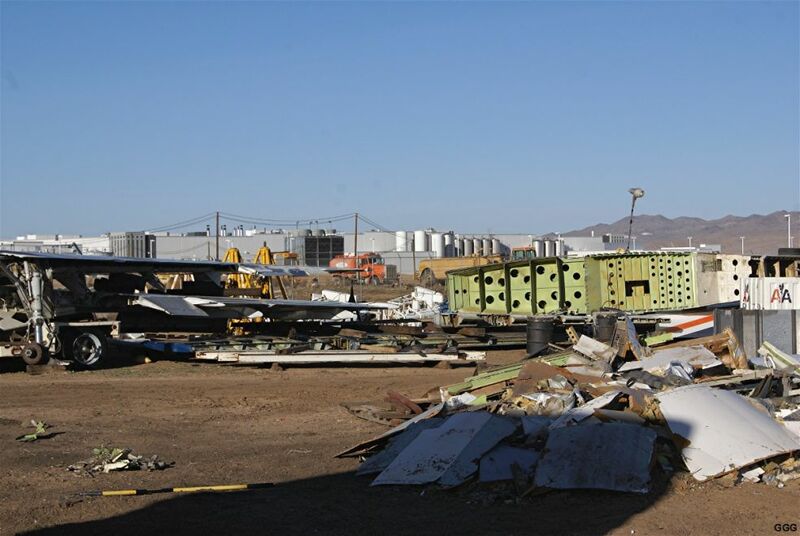 Pictures P-07, 08, 09 are of an independent dismantaler who seems to buy one plane at a time for the scrap value. 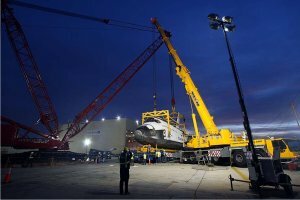 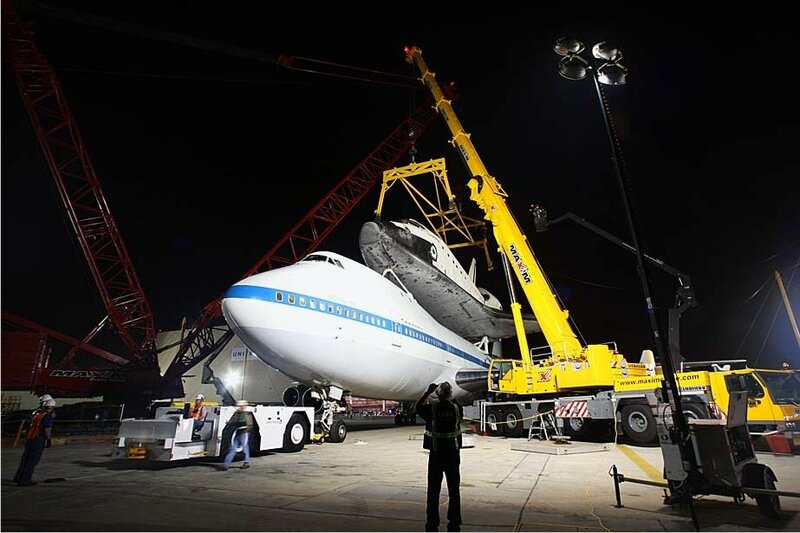 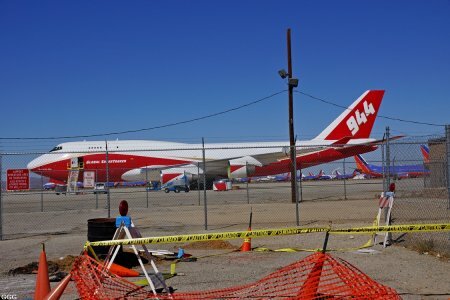 They've been working on Tower Air Lines 747's for years. 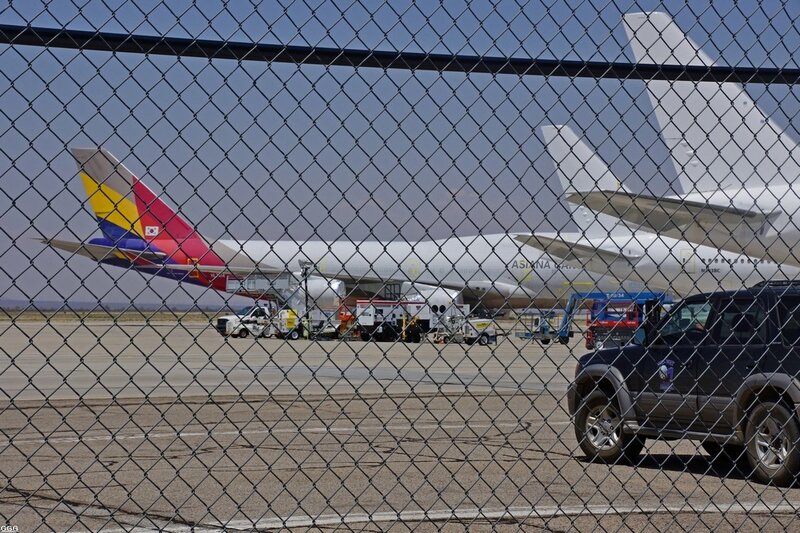 P-08 also shows the new Dr Pepper/Snapple bottling plant. 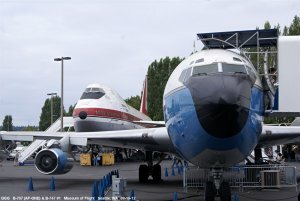 P-10 & P-11 are of a repaint outfit called "Leading Edge". 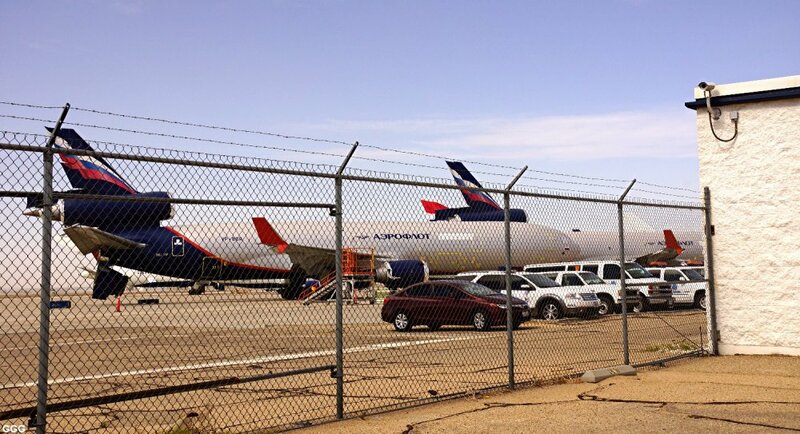 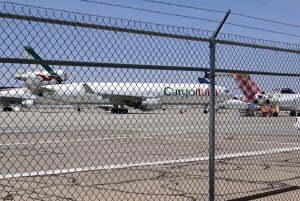 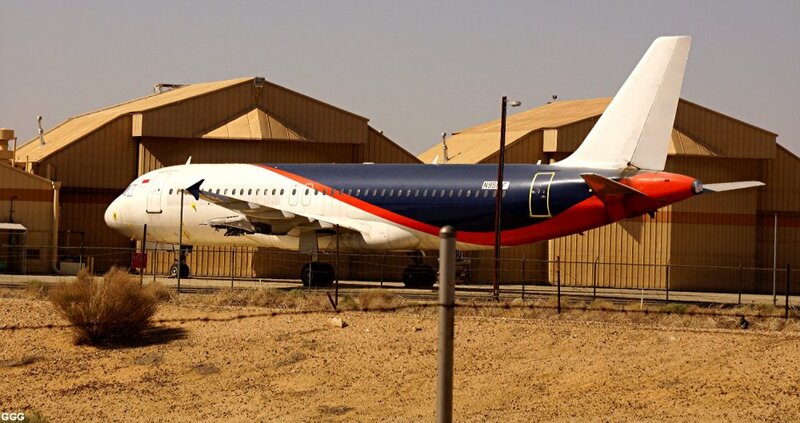 A Delta/NWA A-319 and several Aussie 767's will shortly be returned to service. 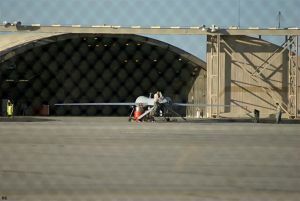 P-12 is of a General Atomics Predator or Reaper outside the old engine "hush house". 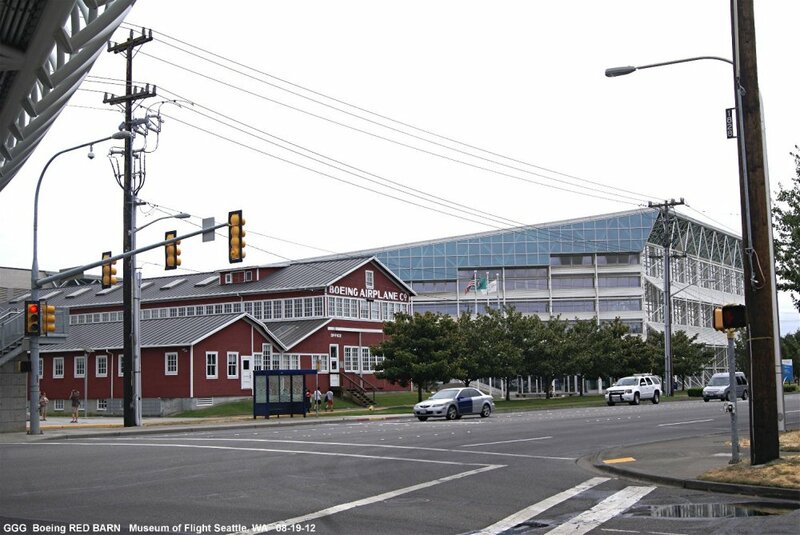 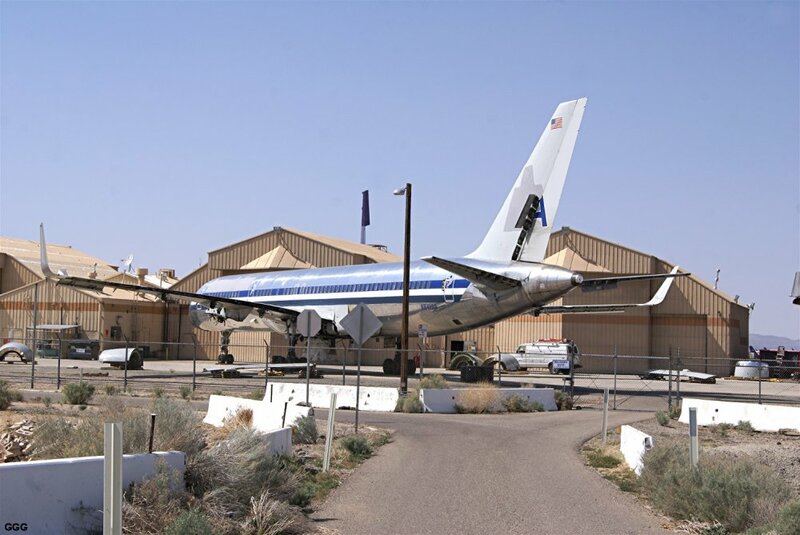 Just for grins --- if you were one of the few people who saw the move FACE OFF with Travolta and Cage, this is the building the private jet "crashed" int --- yeah so?? 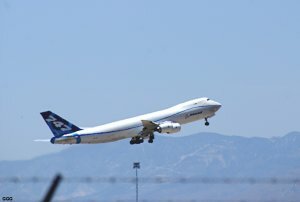 Boeing will be testing the first three new 787's here and the new 747-8's at AF Plant 42 in Palmdale. 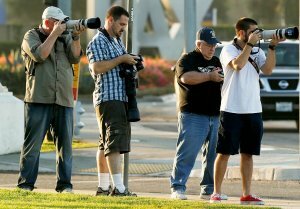 Will try to get some images of both --- or get busted for being a spy or something. 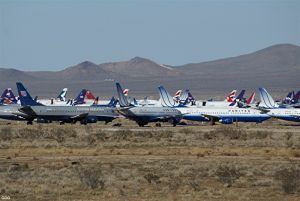 March 22: Knowing that many on this, normally trains, list also love aviation, I'm sending the results of our expedition into our tiny part of the Mojave Desert. 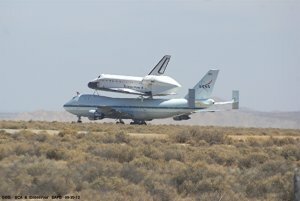 Marc and I, without any specific destination in mind (except for lunch at Mollie Brown's Country Cafe on OLD Rt 66) took off into the desert yesterday. 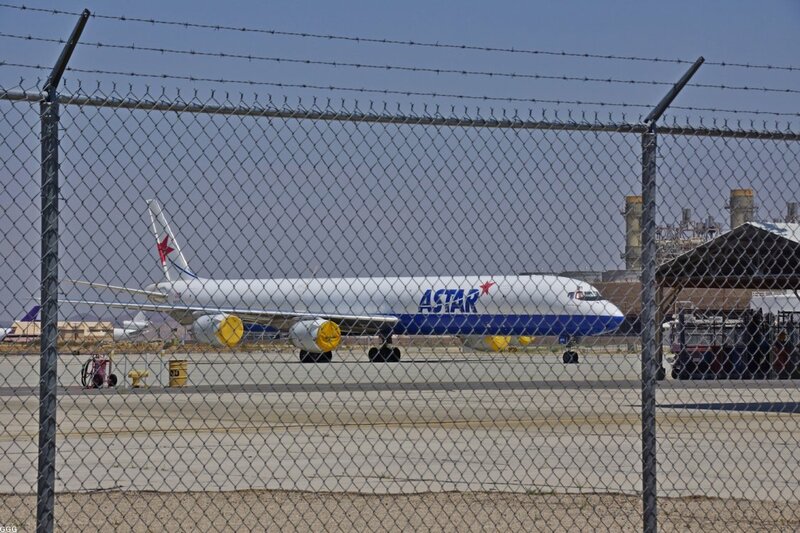 Train traffic was light and so we wound up driving through my old AFB ----- now known as Southern CA Logistics Airport. The Apt has become a testing facility for new aircraft and their new engines. 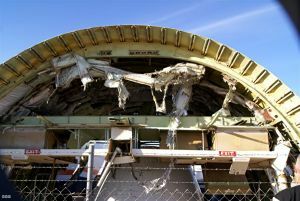 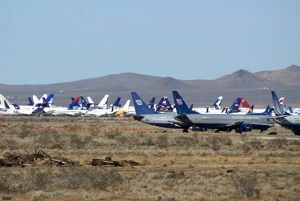 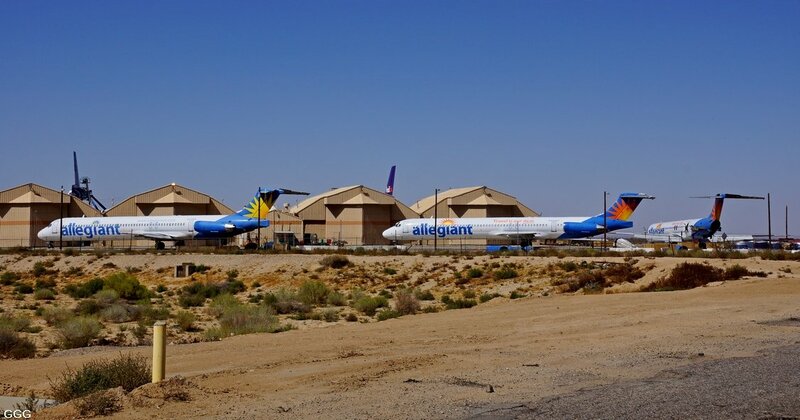 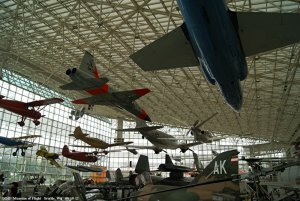 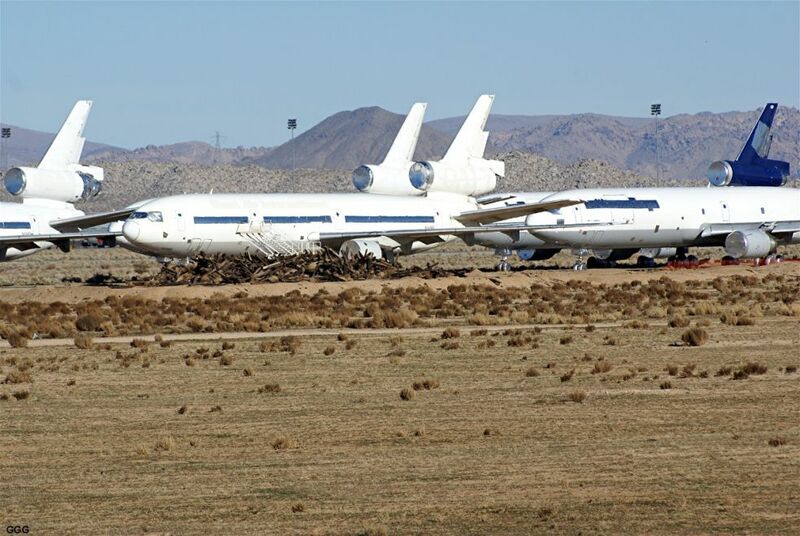 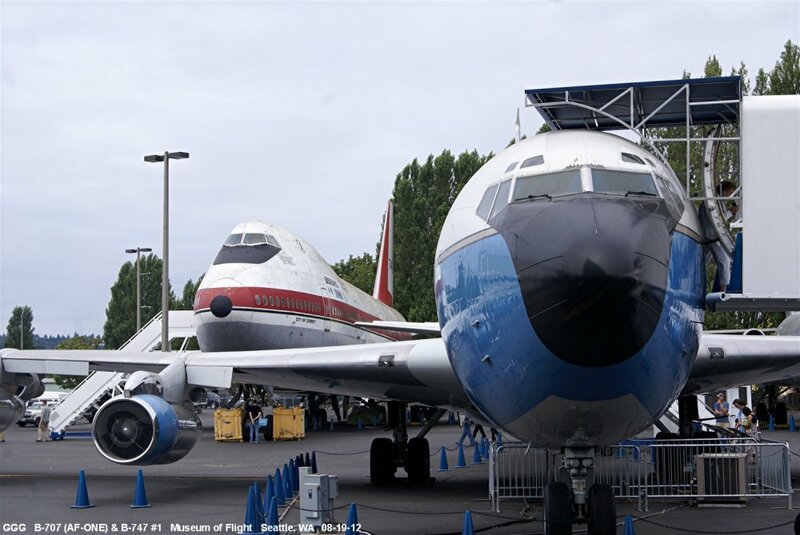 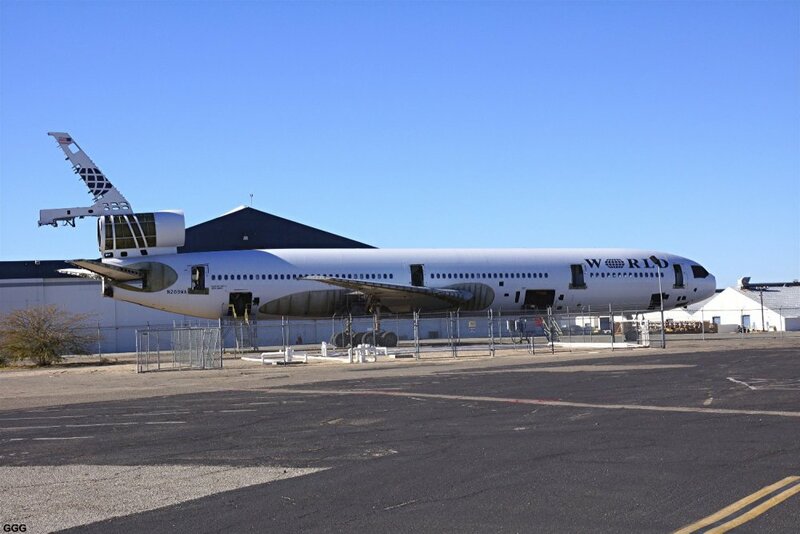 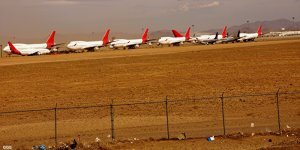 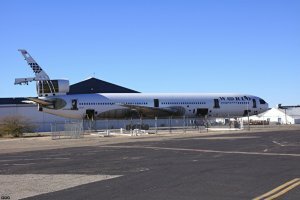 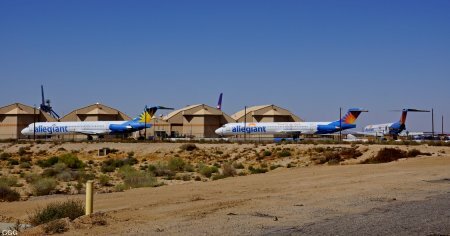 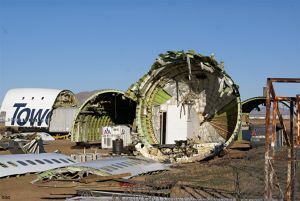 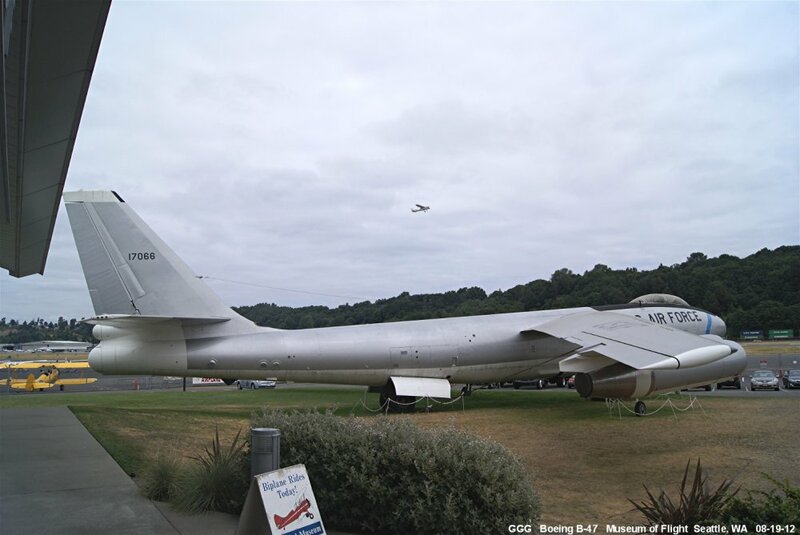 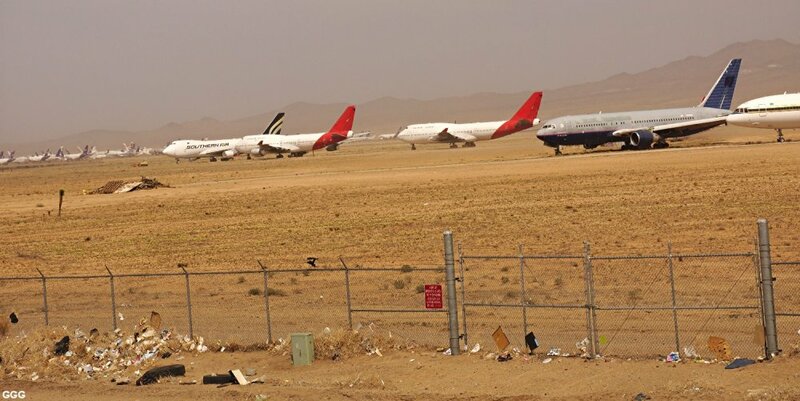 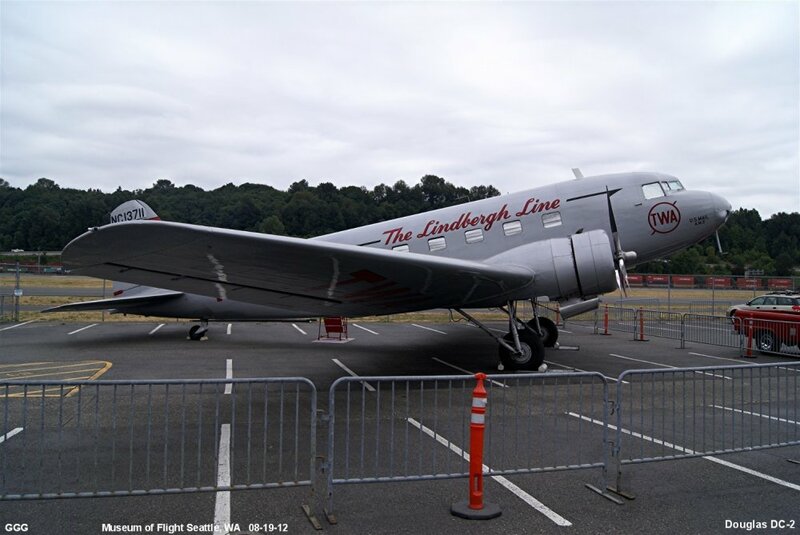 Mostly, it has gained new recognition as a "Boneyard" and recycling center for older civilian airliners. 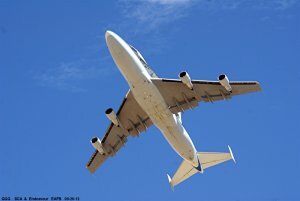 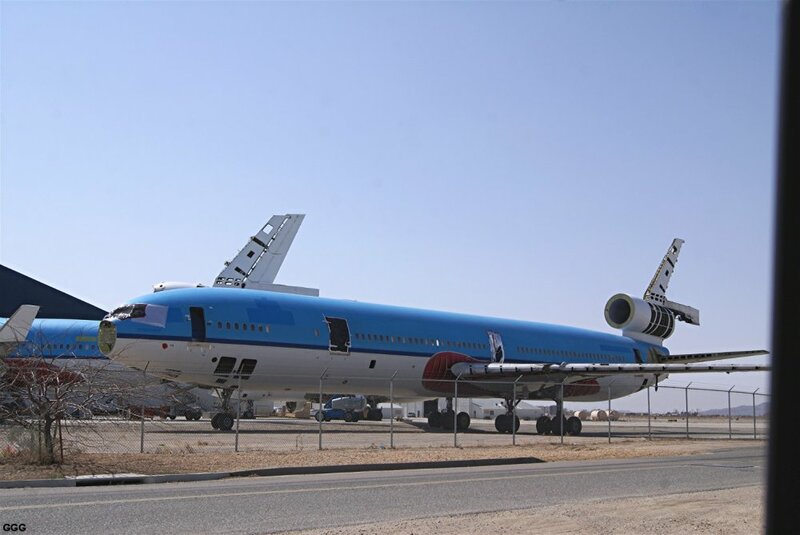 Under active recycling were: # 3040-3043: AA B-757, BA B-747-400, KLM DC-10 & MD-11, FE DC-10's. 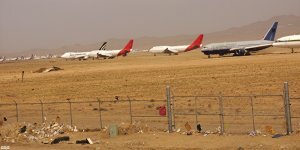 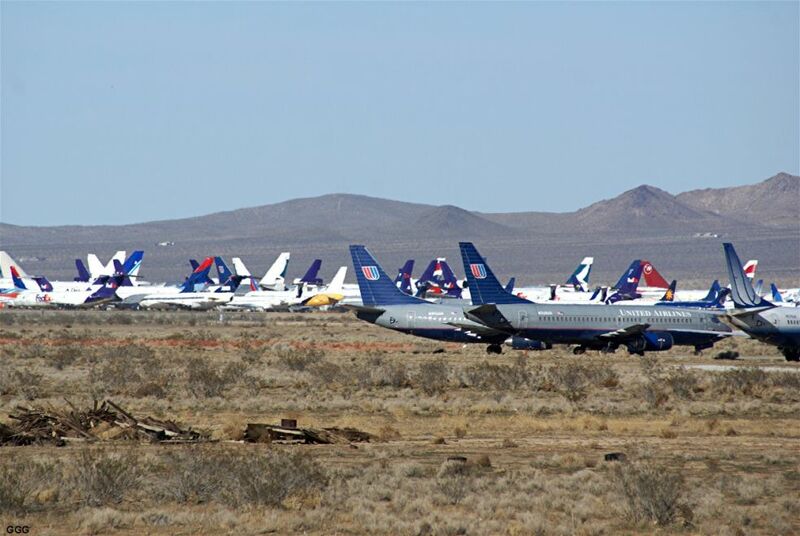 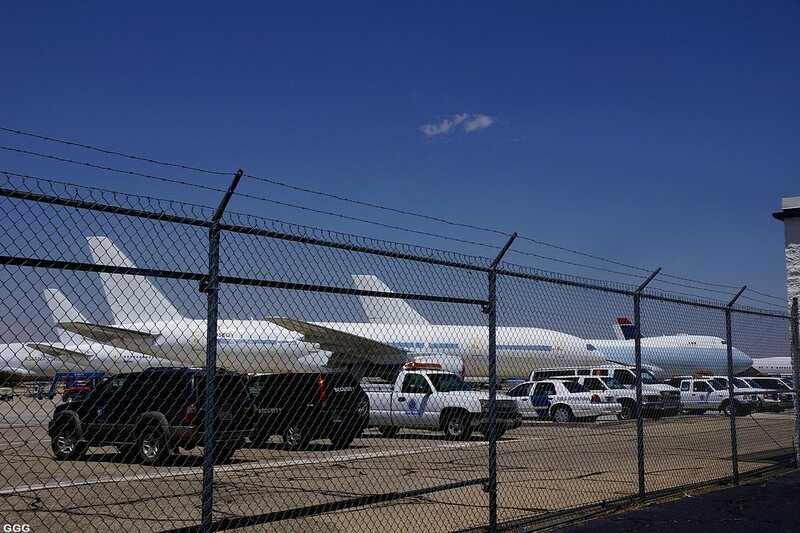 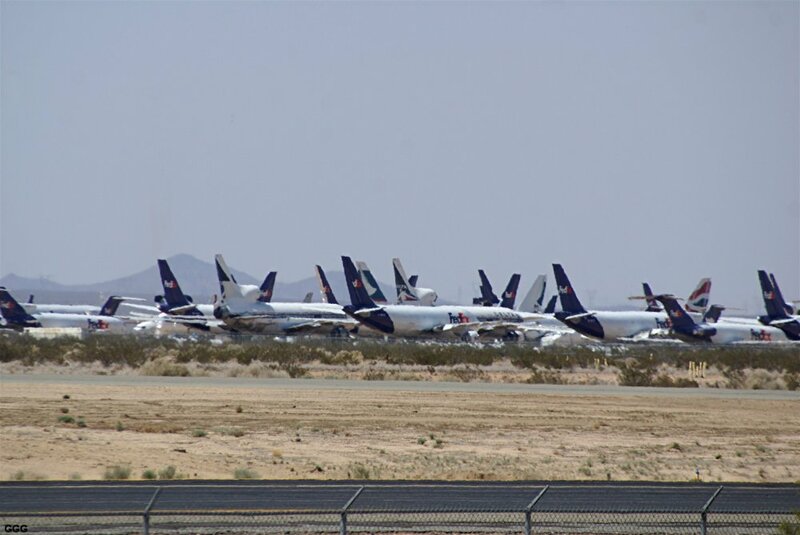 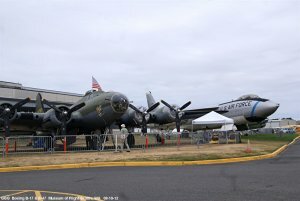 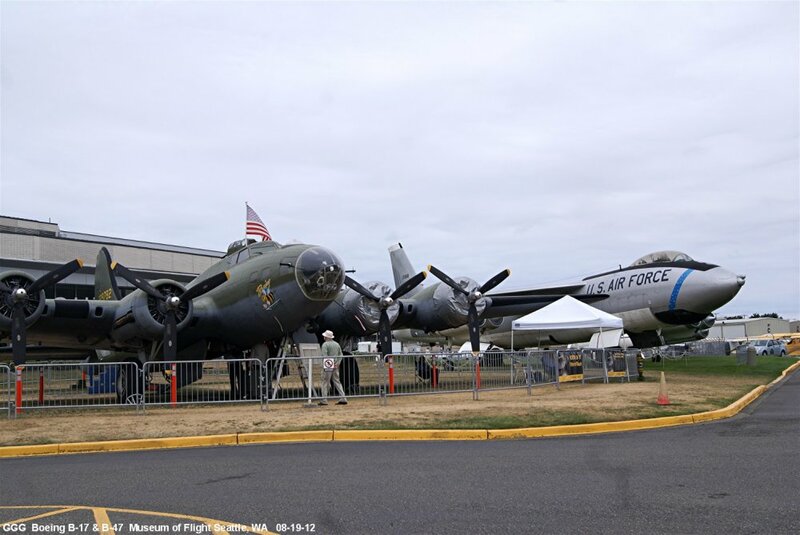 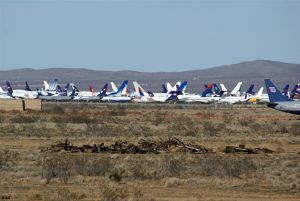 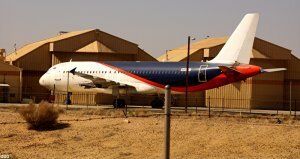 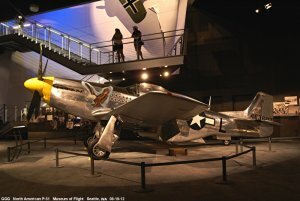 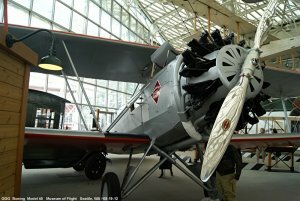 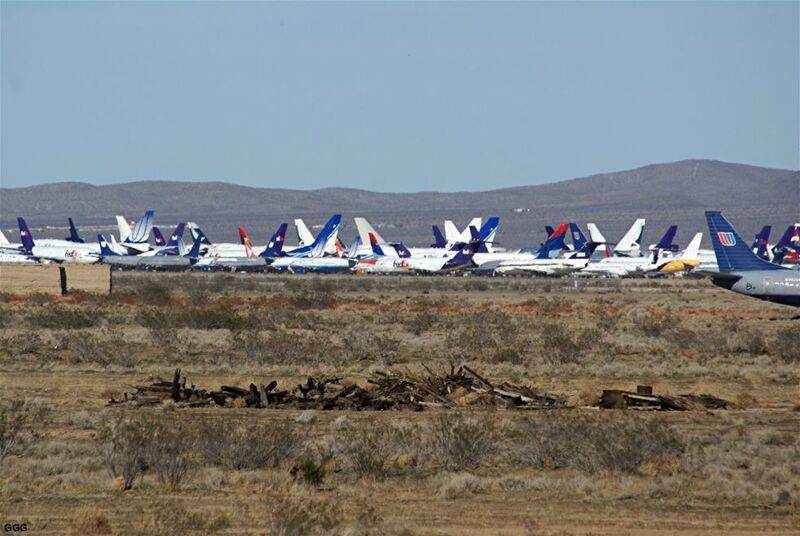 # 3044-3045: A "HEALTHY" supply of aircraft awaiting recycling ----- or sale? 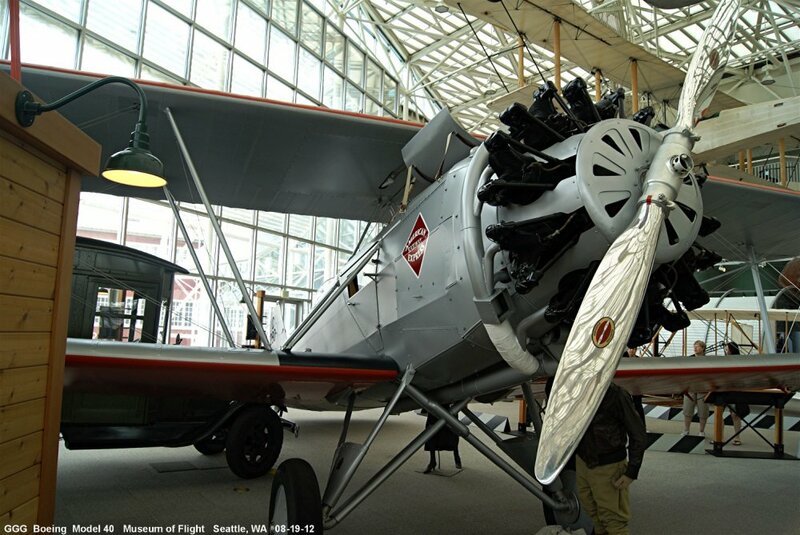 Well, here's a bit to help start your 2014 with "PLANES" and "TRAINS" ----- "properly"! 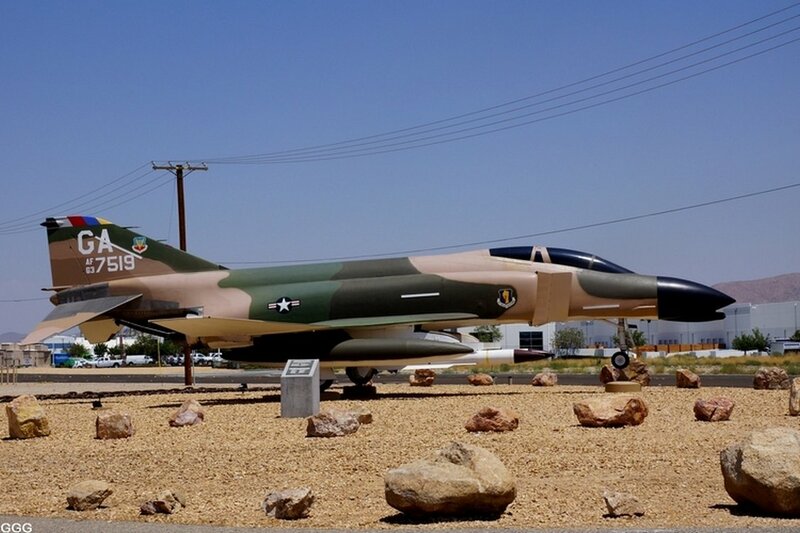 On Friday, January 17, Don Toles visited the High Desert and off we went ---- roaming and making like TRUE Desert Rats. 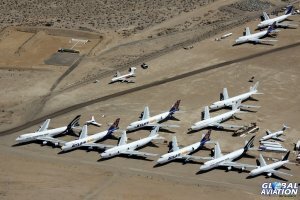 Our first stop was at my old USAF Base (George) now known as Southern California Logistics Airport (SCLA). 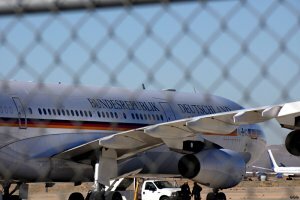 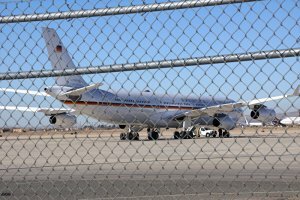 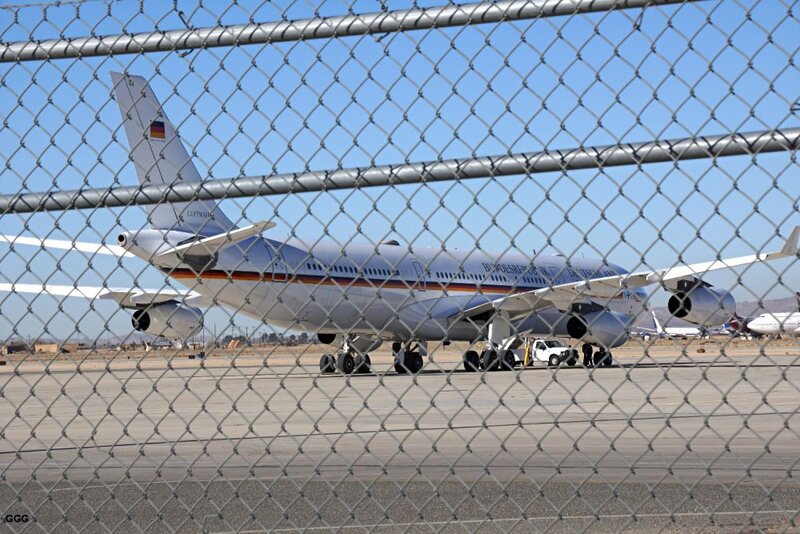 # 4001-4002: German Government A-340-300 VIP aircraft. 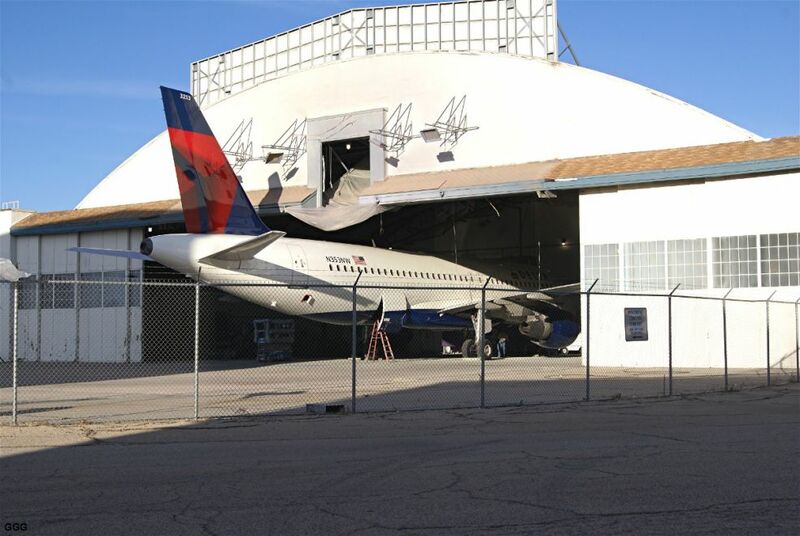 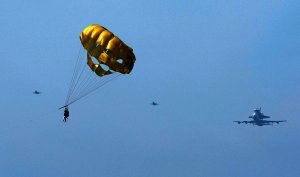 The reason for the aircraft visit is unknown to us. 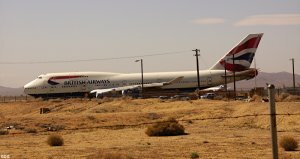 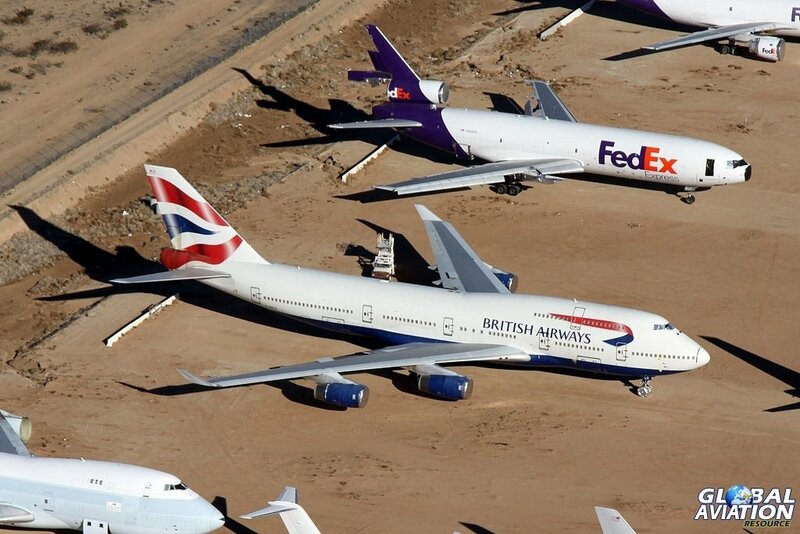 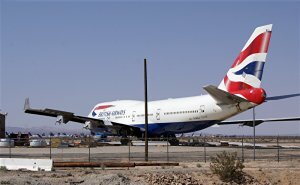 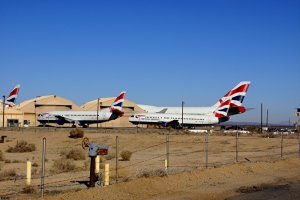 # 4003: Four retired British Airways Aircraft (two B-747-400's and two B-737-400's) being "parted-out" for recycling. 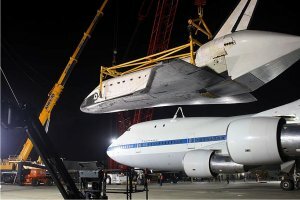 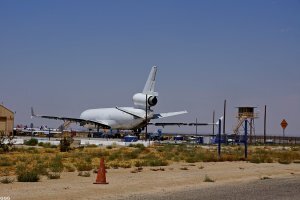 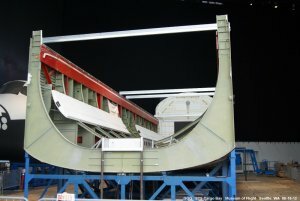 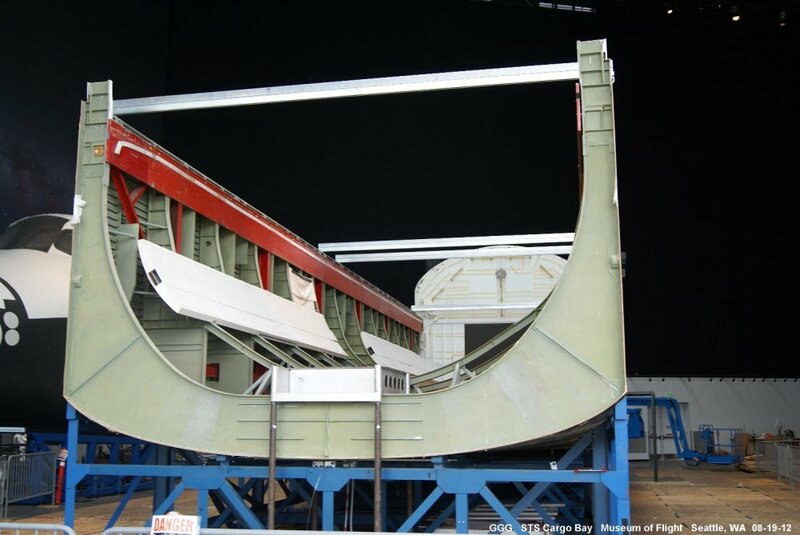 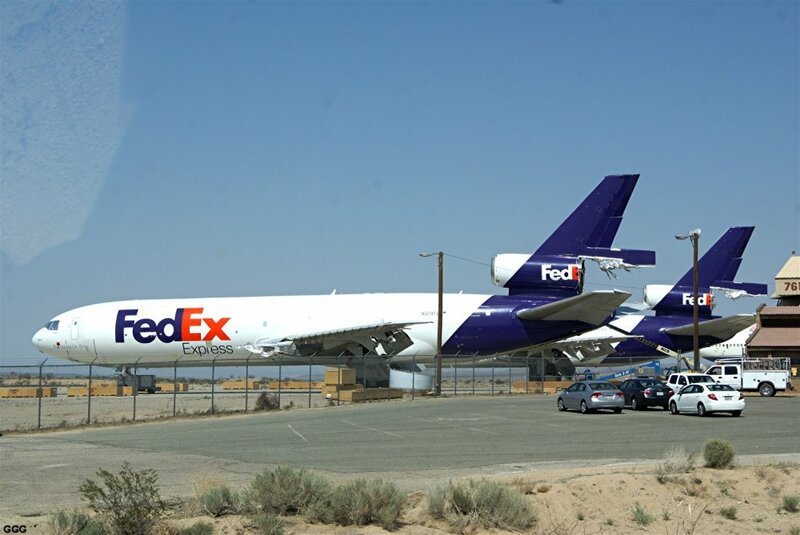 # 4004-4005: Two MD-11's becoming parts. 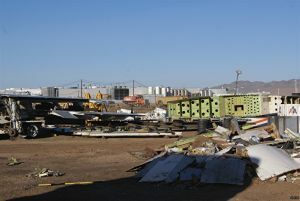 After lunch a DA DUMP #2 --- Mollie's on Rt 66 near Helendale, we adjourned to the BNSF Mojave River Bridges at Cajon Sub MP 34.1. 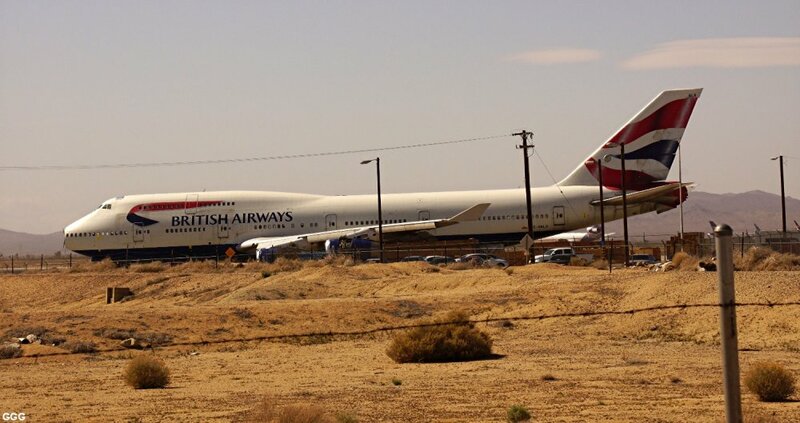 # 4006: Another British Airways 747-400 turns DOWNWIND for SCLA, on what is PROBABLY its last flight. 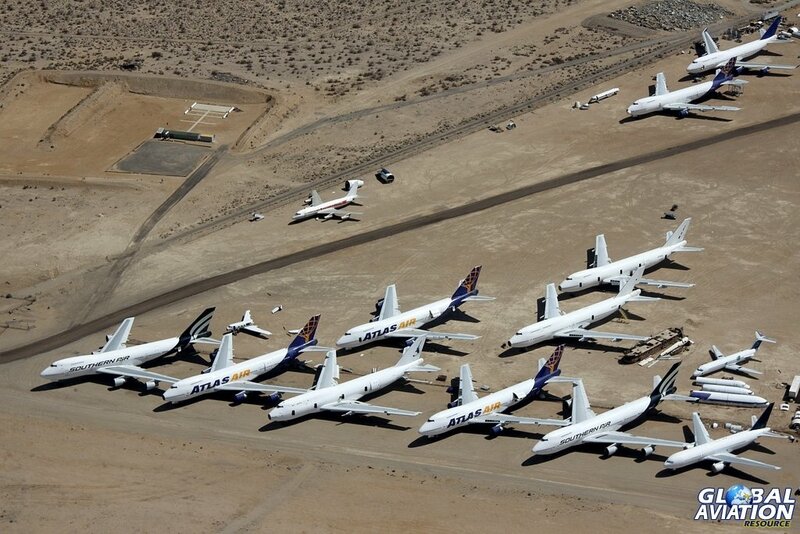 March 27, 2014: My old USAF Base (SCLA) has developed into a major recycling center for retired civilian aircraft. 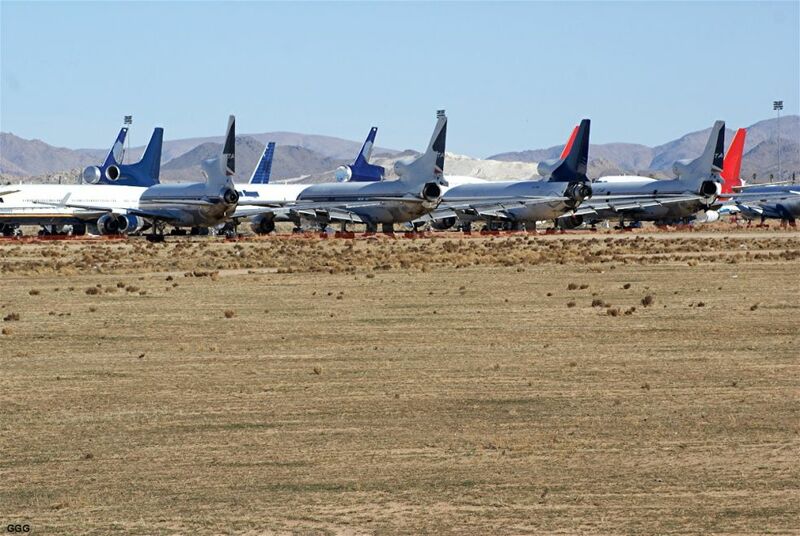 During our (with R & R Scanes-NZ) visit, I was somewhat surprised by the number of aircraft resting there from 'foreign' air carriers. 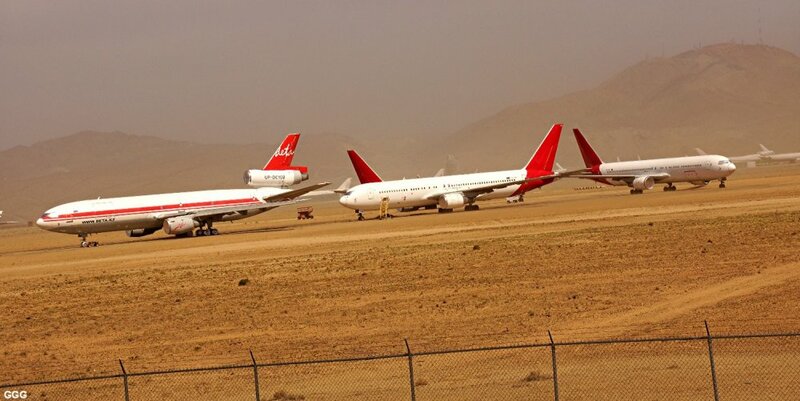 I was also surprised at how much dust a HABOOB can move. 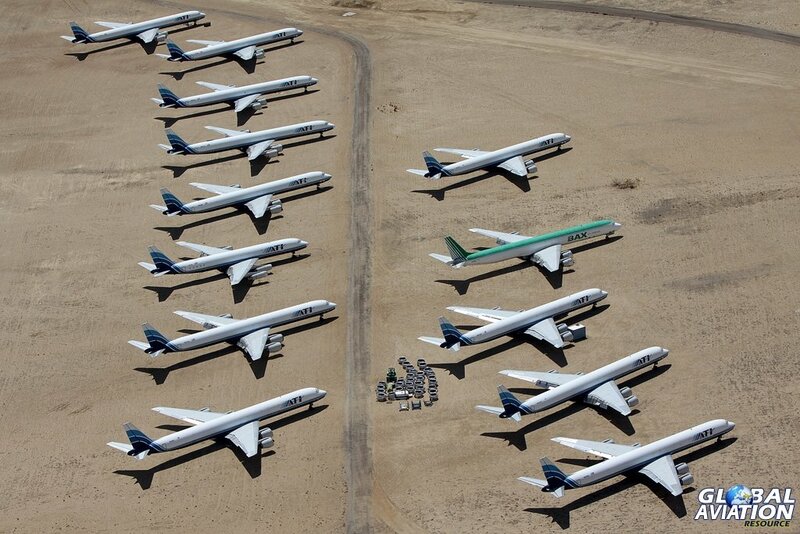 # 4047-4049: Quantas is obviously retiring most of its fleet of B-747's, 767's and older 737's. 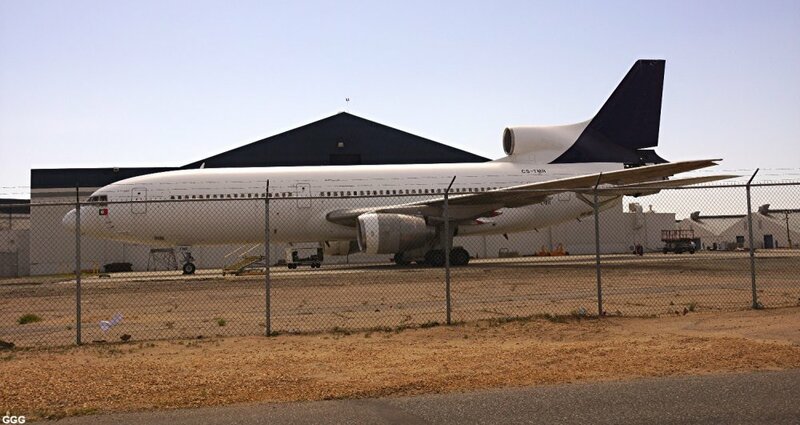 The DETA Air DC-10 is from a Kazakhstan airline. 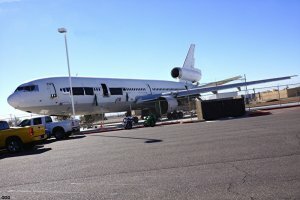 The UAL aircraft is a B-767. 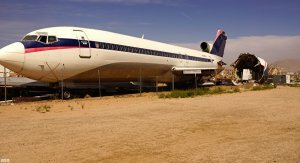 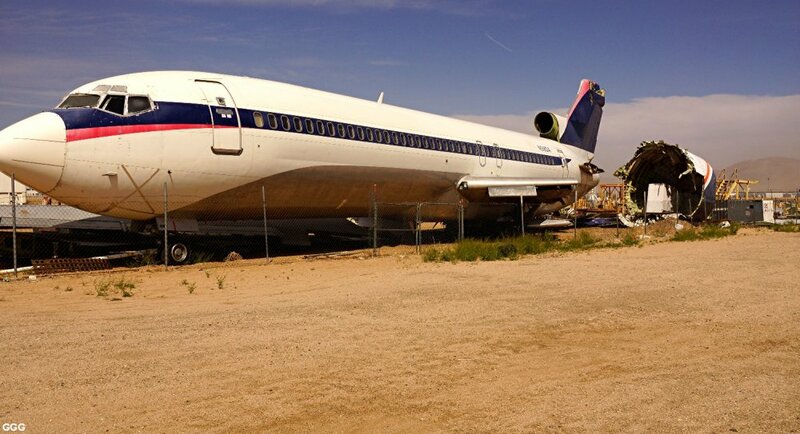 # 4050: A really old Delta B-727. 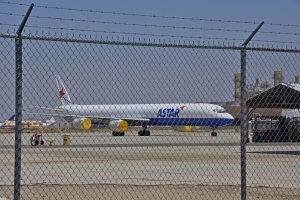 # 4051: Three MD-11F's from Russia. # 4052: This three year old IRAQI AIR B-777, according to the airline BLOGS, was returned to Boeing who, in turn, sent it to SCLA for storage. 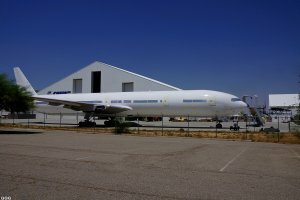 # 4053: A LUZAIR (Portugal) L-1011. 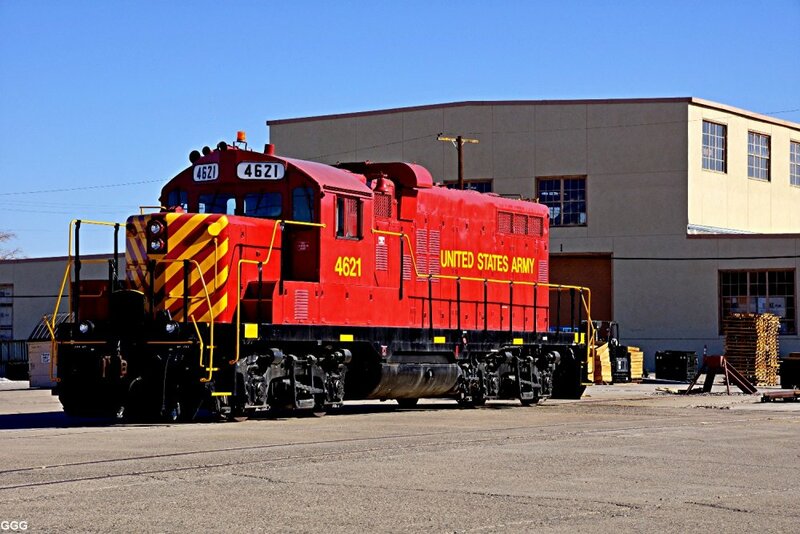 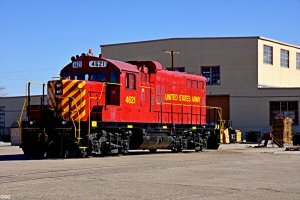 # 4054: An AB 319? 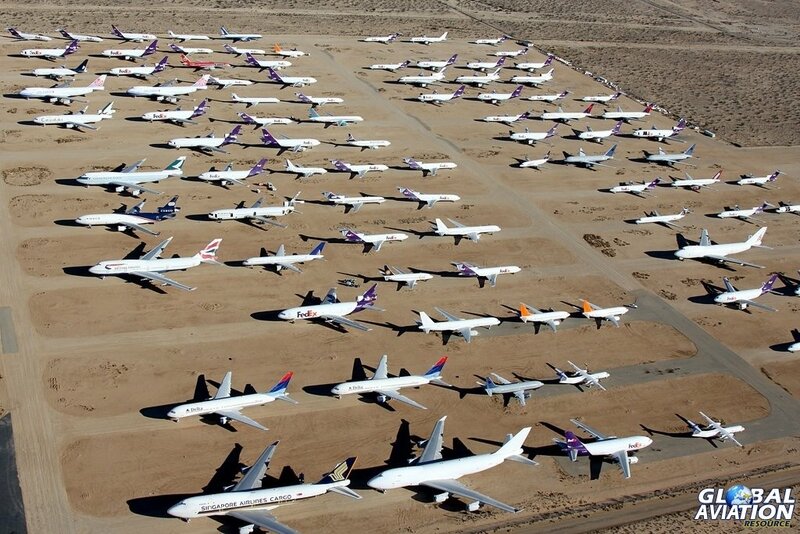 from an unknown airline. 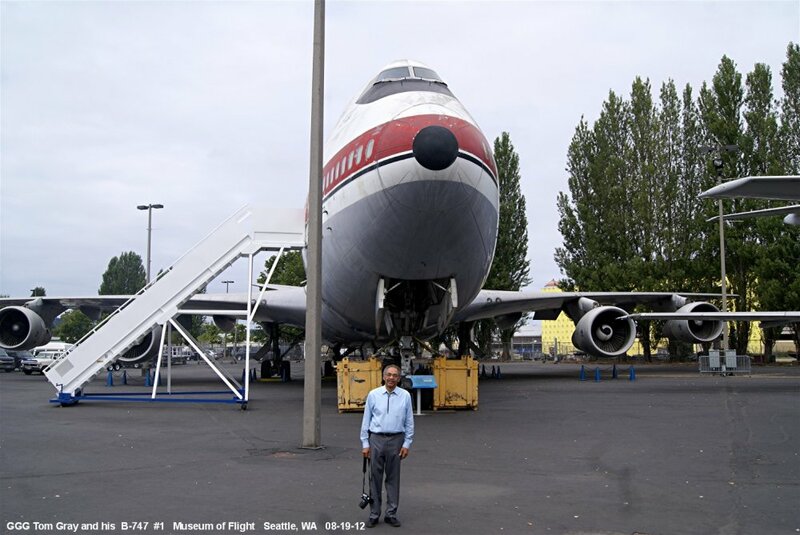 Last week (11/06/14 and 11/10/14), I had several appointments around the area and so, I was mostly 'on my own'. 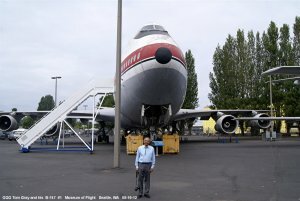 NATURALLY, I "gyrated" toward anything related to planes or trains. 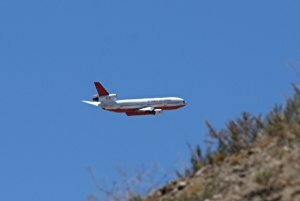 I hope you enjoy this presentation - as much as I enjoyed photographing it. 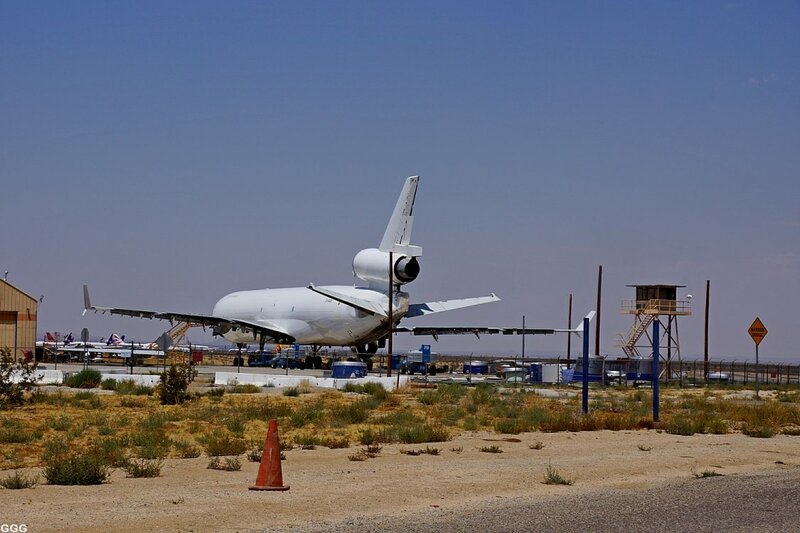 At "SCLA" Southern California Logistics Airport (former George AFB). 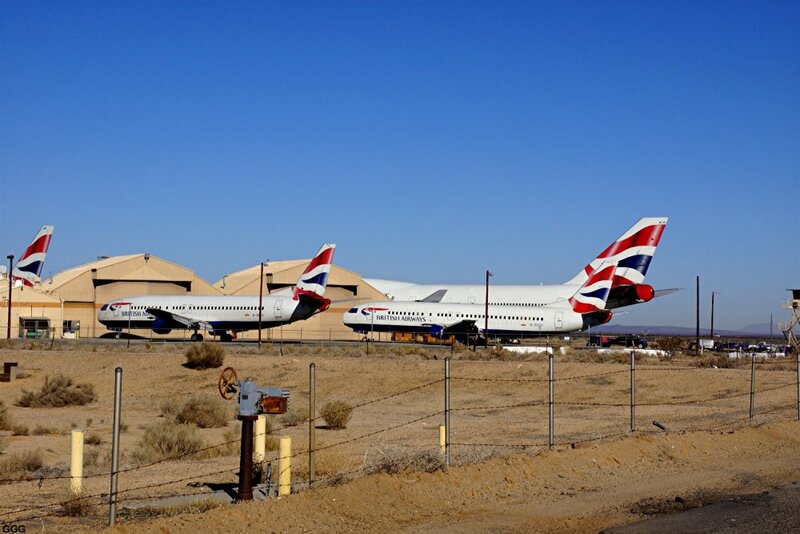 # 4140: Recent British Airways recycling arrivals - Boeing 767, 747, 737. 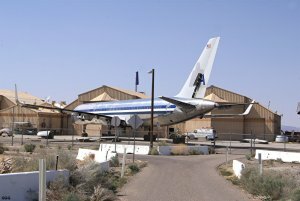 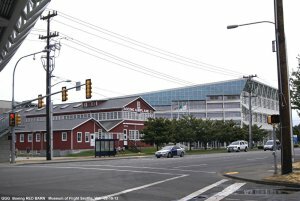 This small facility was the former USAF Air Defense Alert "Barn/hangar" and housed, at different times, FULLY ARMED F-102's, F-106's and lastly F-16's. 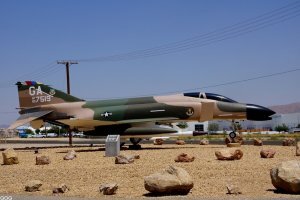 August 6, 2017: Gary Gray visited "his old" George AFB in Victorville, CA. 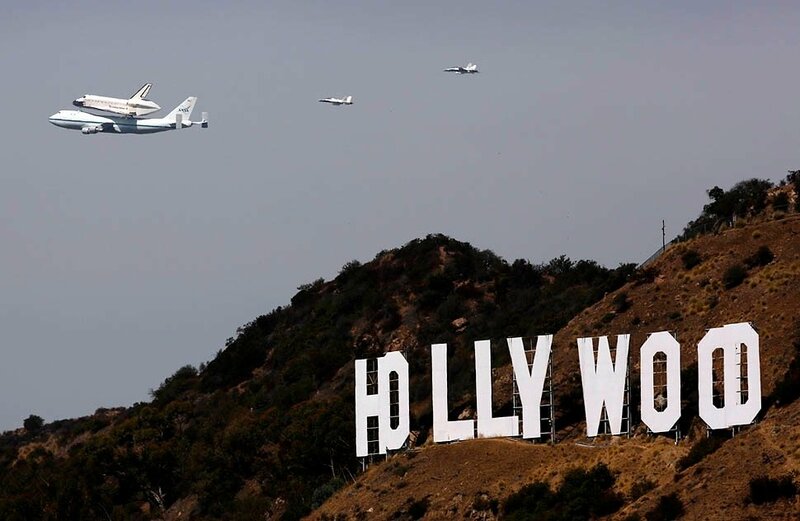 Now known as SCLA. Most have read that the USAF has issued a requirement for two new Presidential Aircraft --- commonly known as AIR FORCE ONE when the POTUS is aboard. 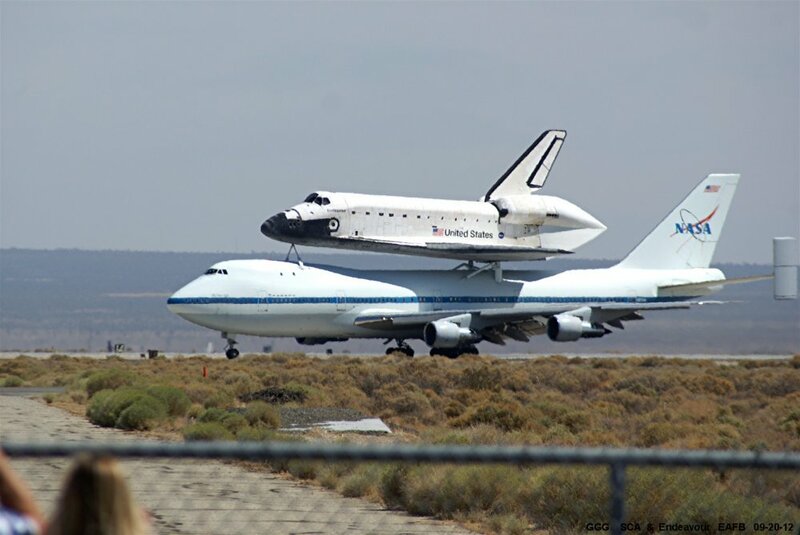 Only two 'in production' aircraft meet the MANY MANY MANY Presidential aircraft requirements --- two of which demand a four engine aircraft with a huge square footage of usable deck space. 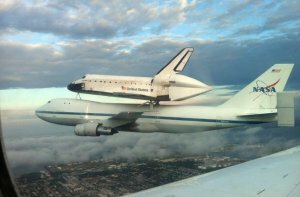 Of course, the USA would never allow the President to routinely use a foreign built (read Airbus) aircraft --- leaving the Boeing 747-8 as the only contender. 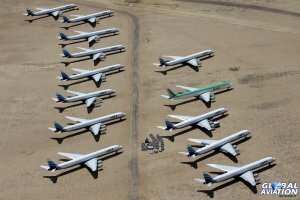 Candidate Trump strongly railed against the new AF #1 project costs during the Presidential campaign. 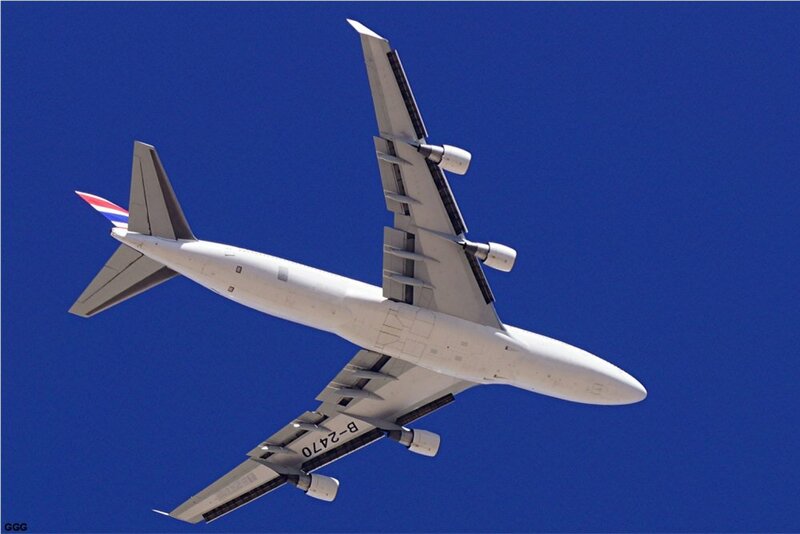 In 2013, a new Russian airline ordered four B-747-8i aircraft and, later, went bankrupt. 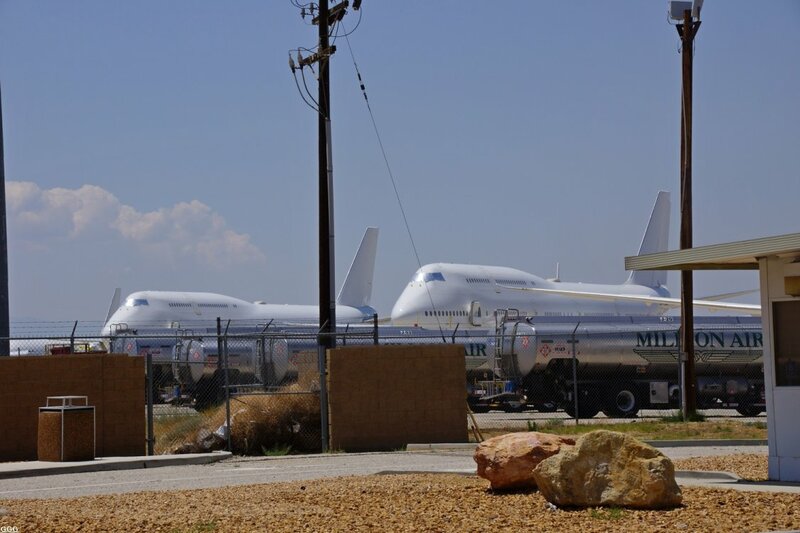 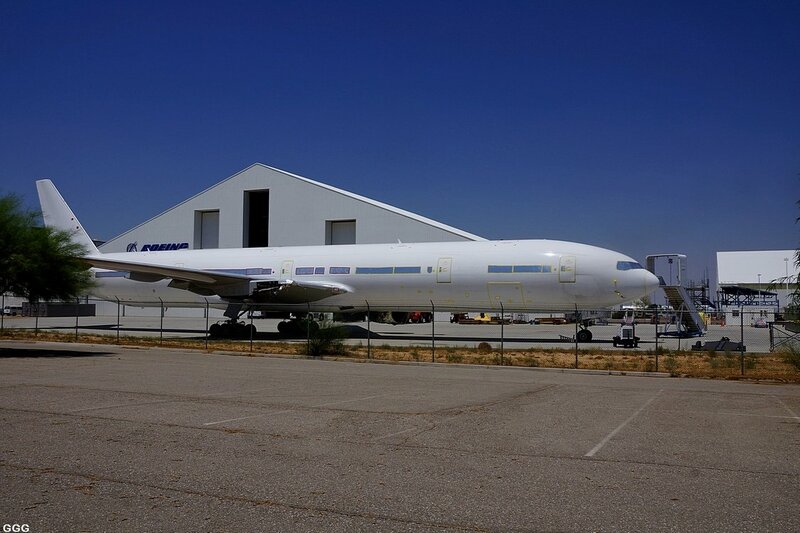 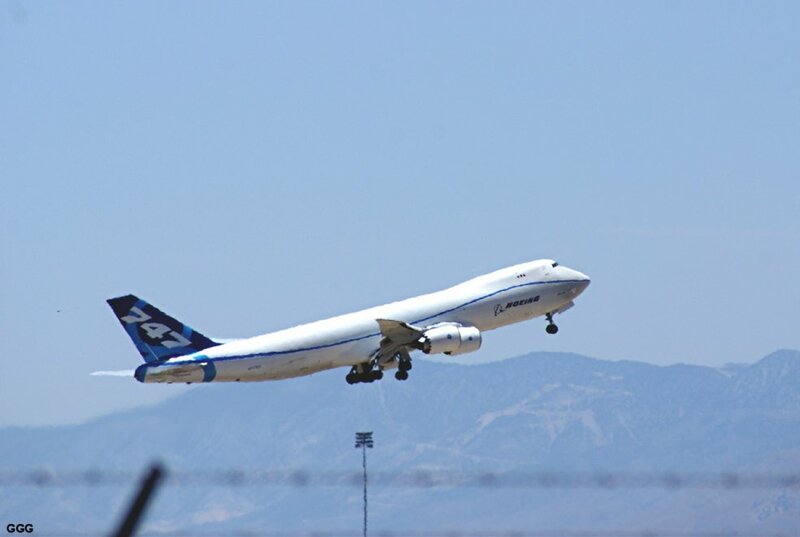 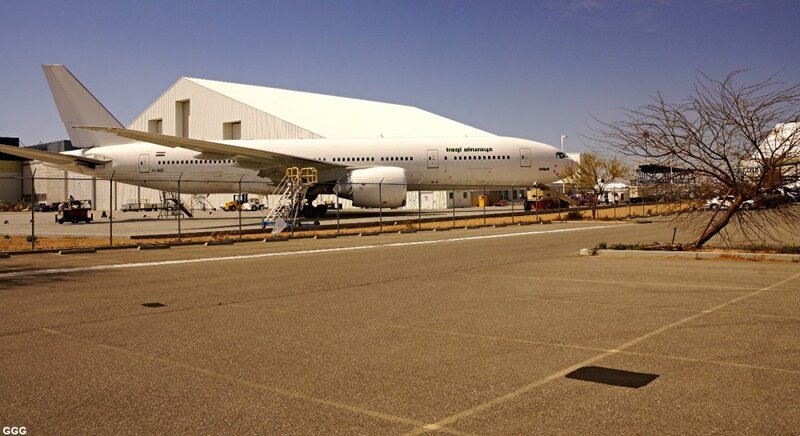 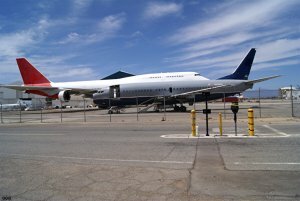 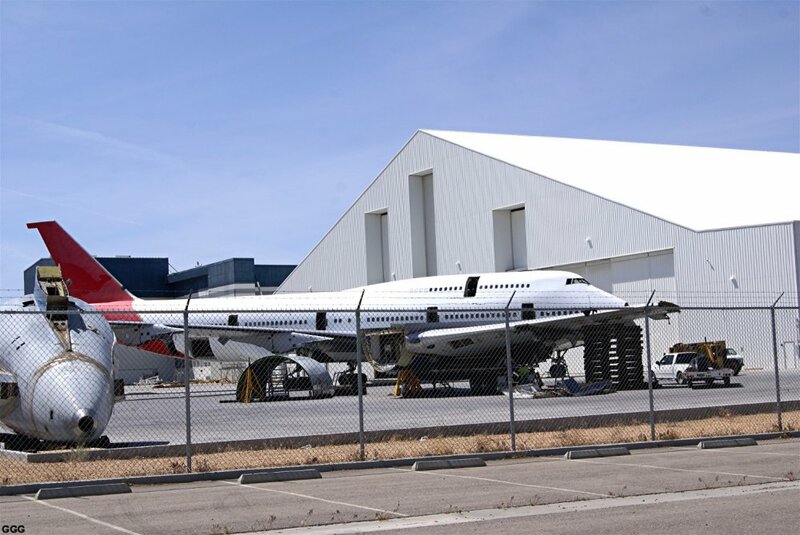 Two aircraft (747i's) were built and flown to SCLA for long-term storage in late 2016. 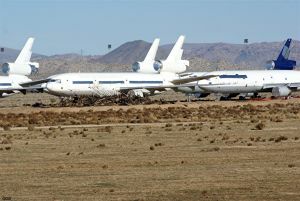 Evidently, the USAF & BOEING are now "talking" !!!! 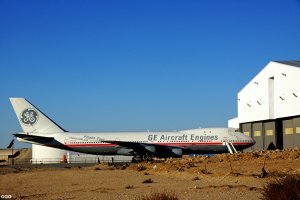 Last Sunday (8/6/17), Laura & I decided to go tour my old George AFB and find the two TOTALLY UNUSED 747 airframes mentioned above. Naturally, the Big Boeings were "hidden" between Flight Line buildings and other large aircraft. 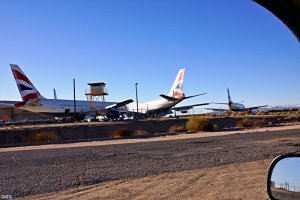 October 2, 2017: Gary Gray & Marc Fournier drove out to SCLA to photograph two new "projects". 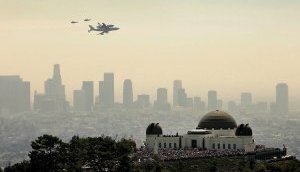 Most are aware of V. W. emission problems with the US EPA. 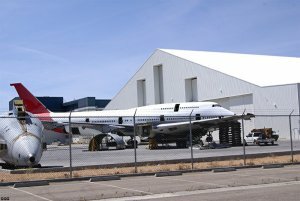 A portion of SCLA has been rented for BUY-BACK storage---along with many other areas across the US. 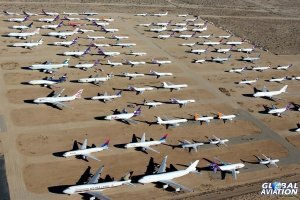 Marc counted 200 rows with (up to) 100 cars in each row. 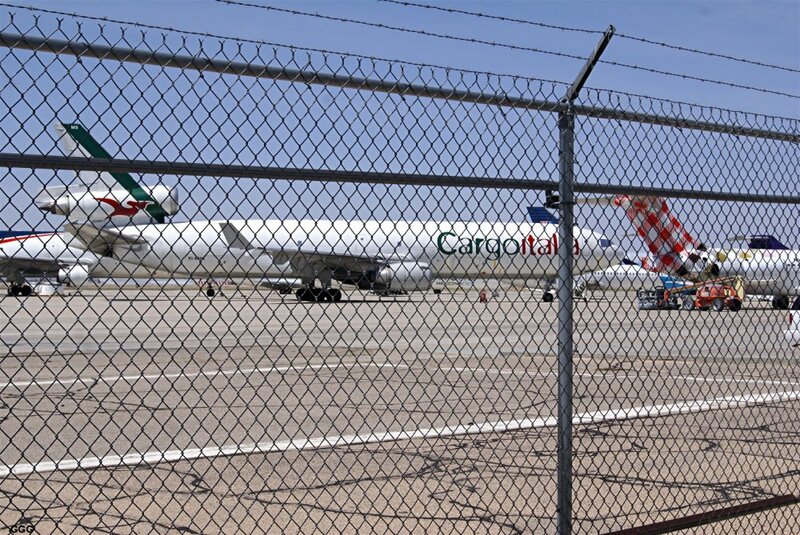 New PRIVACY fencing & lighting has been installed around the guarded area. 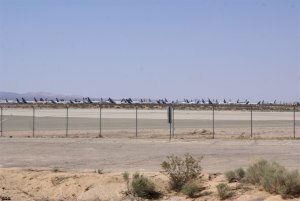 The area is approx 1.5 long by .5 miles wide. 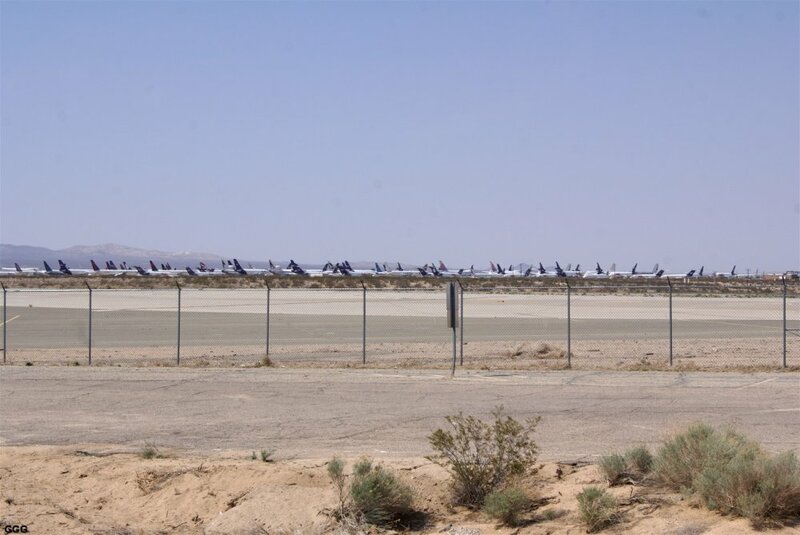 We ESTIMATE that there are, at least, 15,000 V.W. 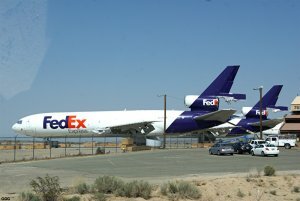 products in the lot. These pictures do not accurately show the size of the area. 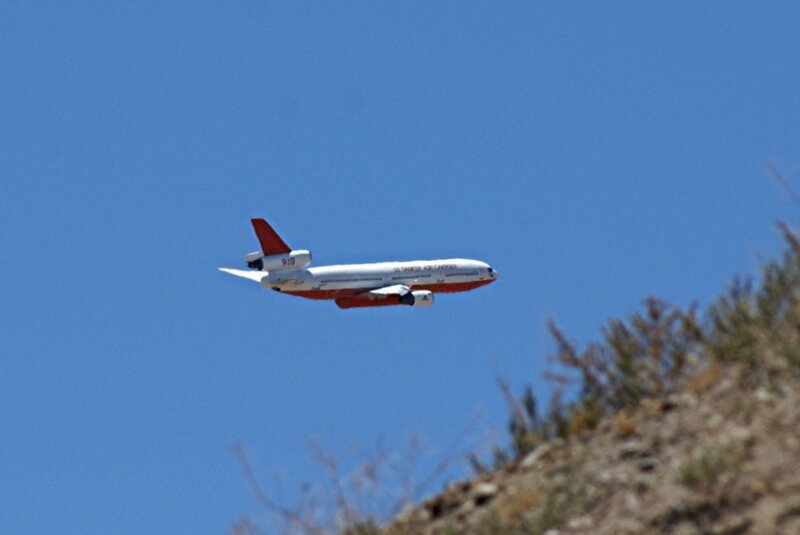 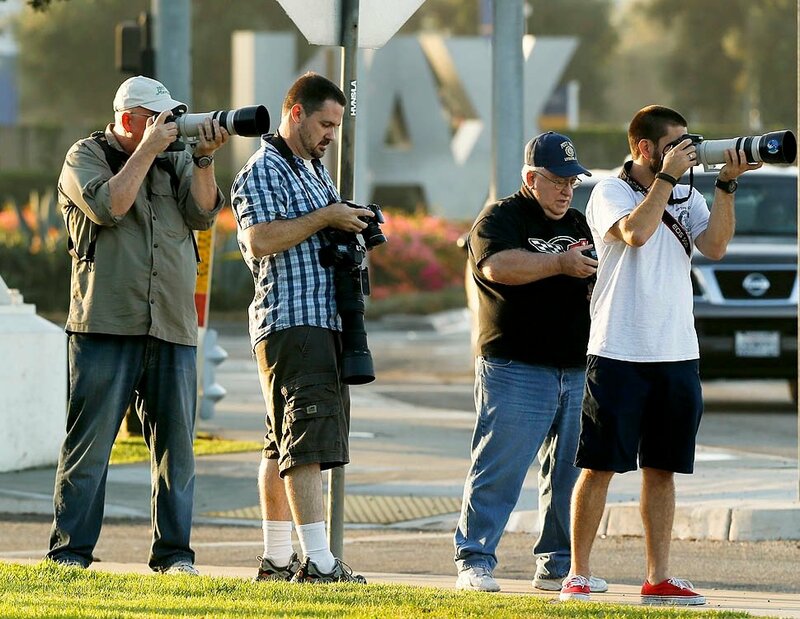 October 21, 2017: Gary Gray drove out to SCLA to photograph the Global Supertanker. 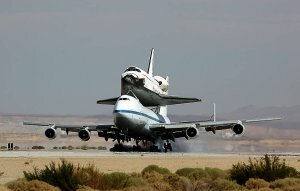 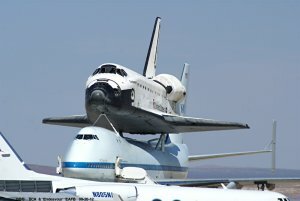 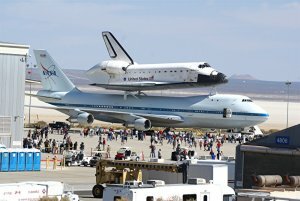 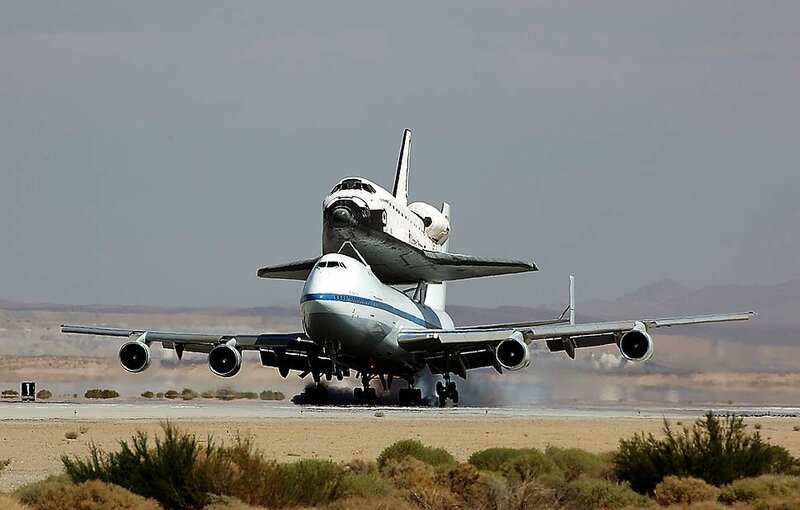 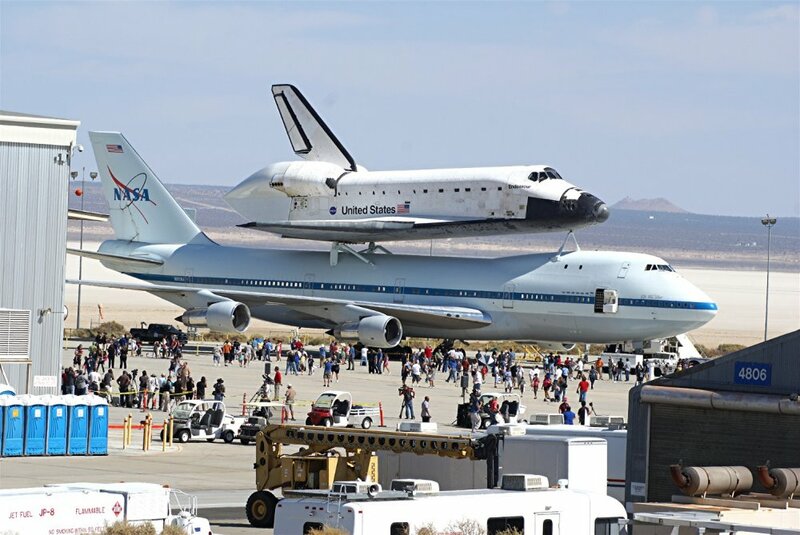 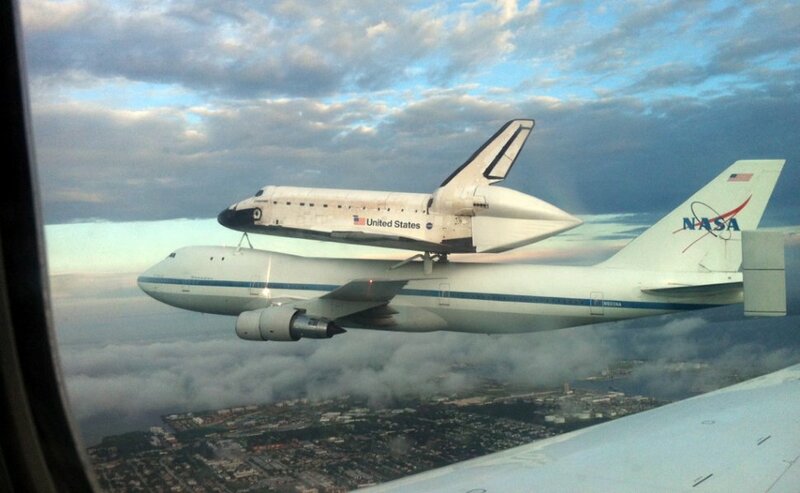 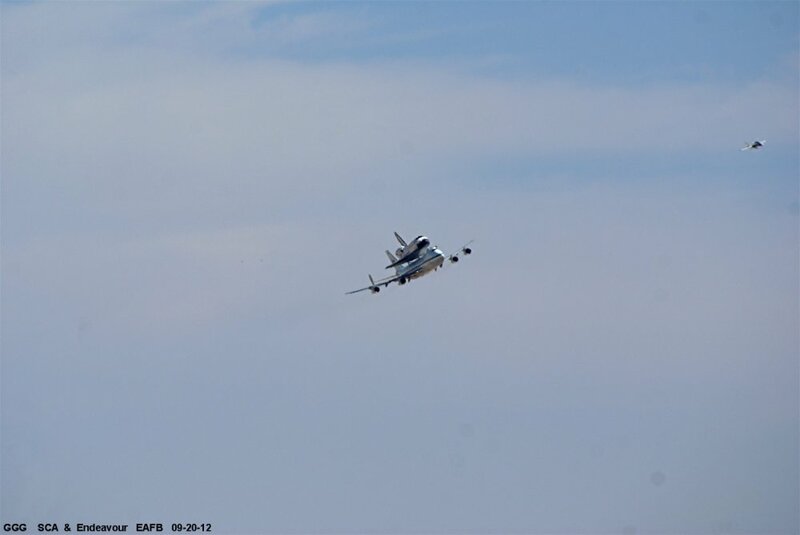 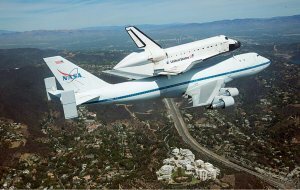 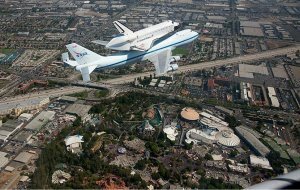 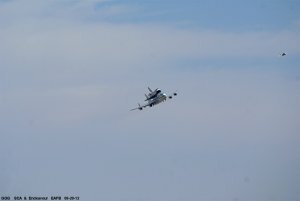 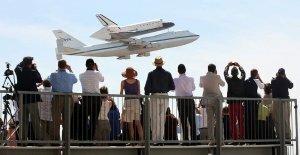 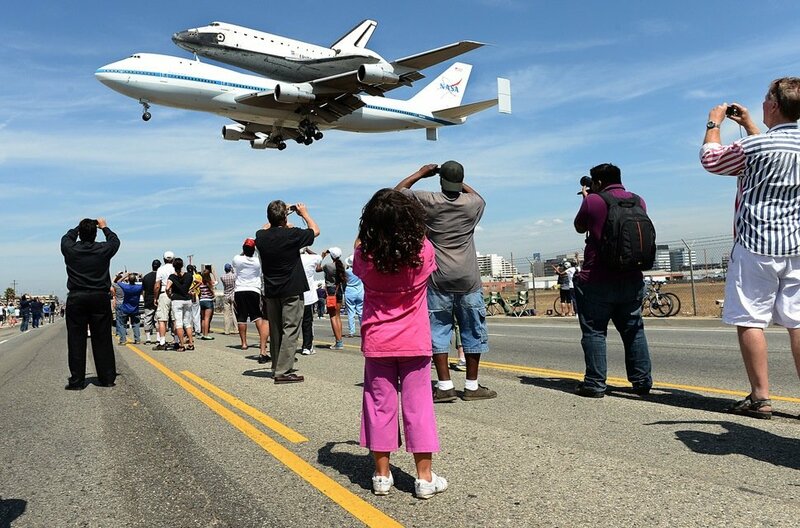 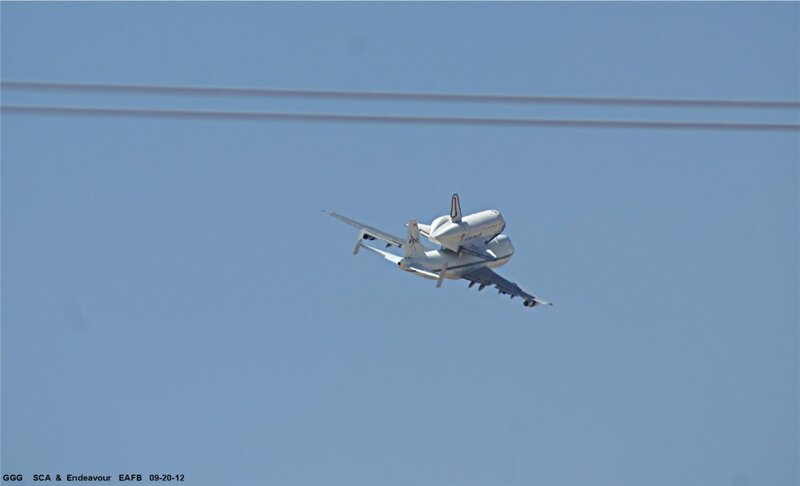 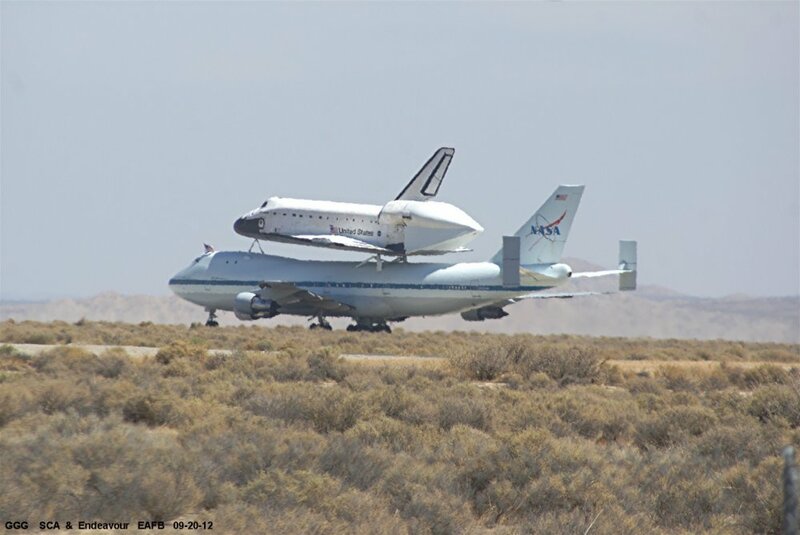 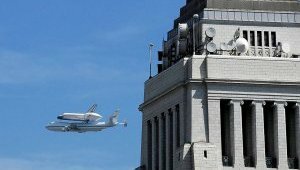 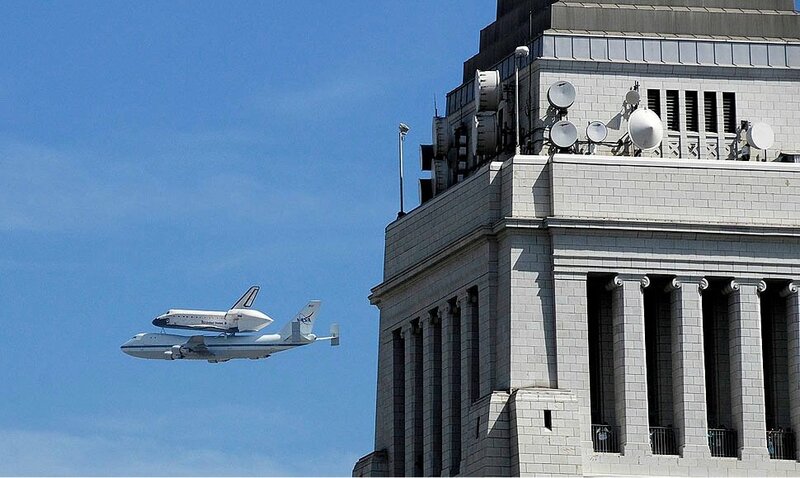 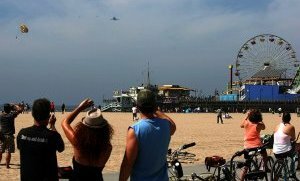 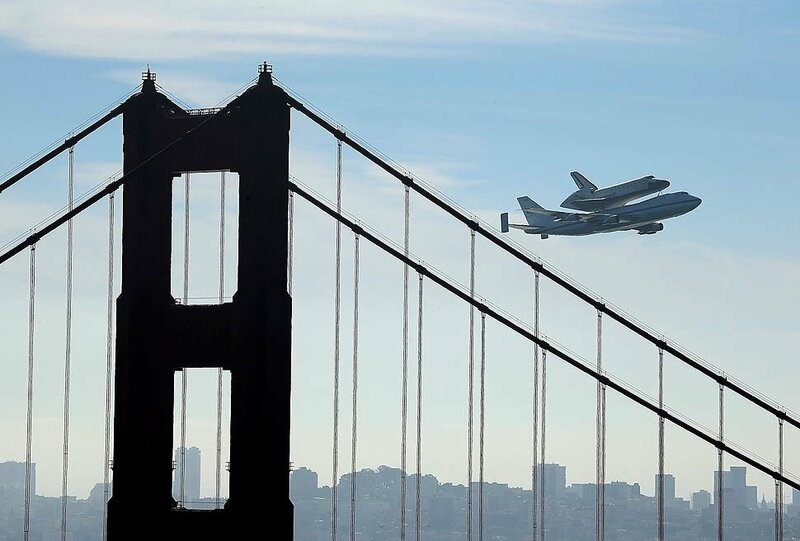 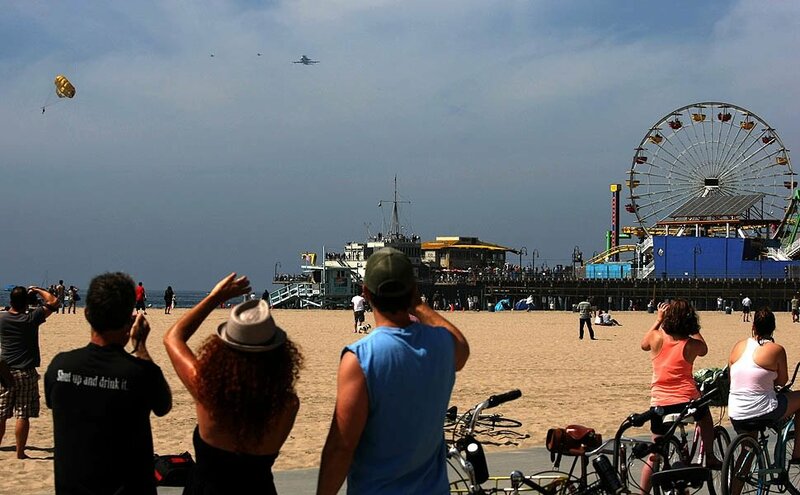 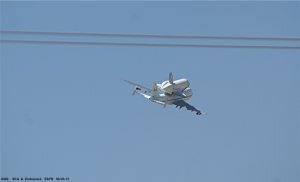 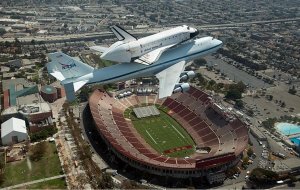 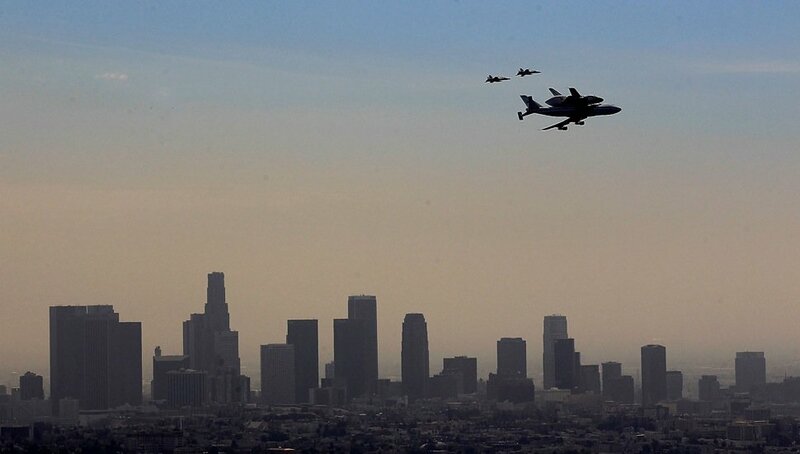 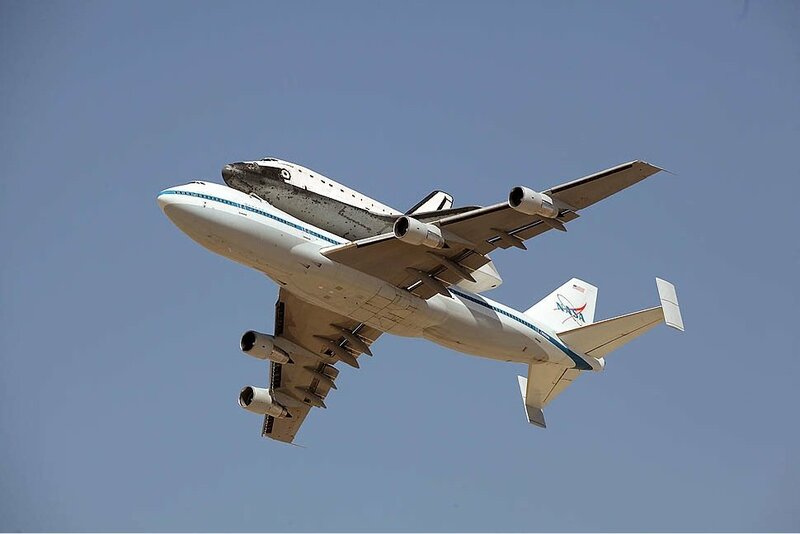 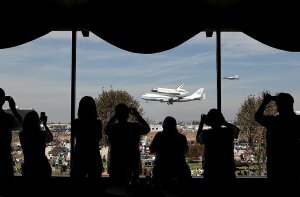 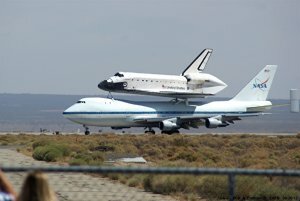 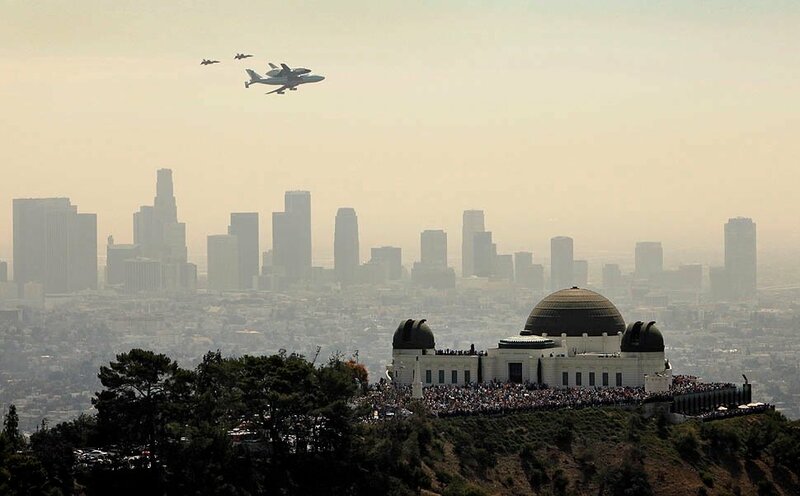 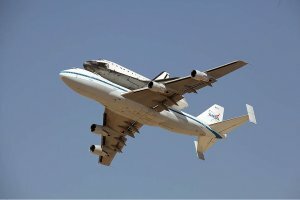 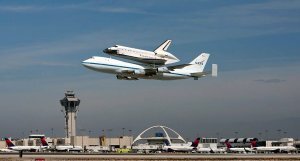 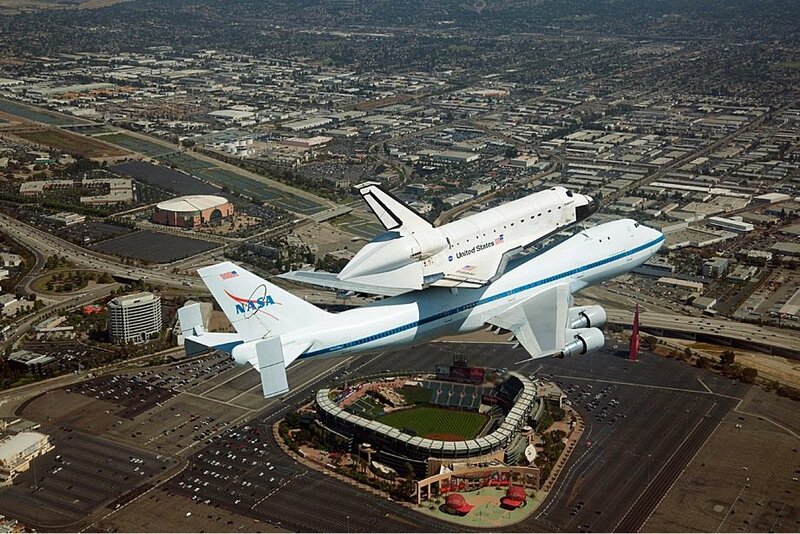 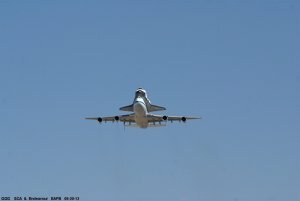 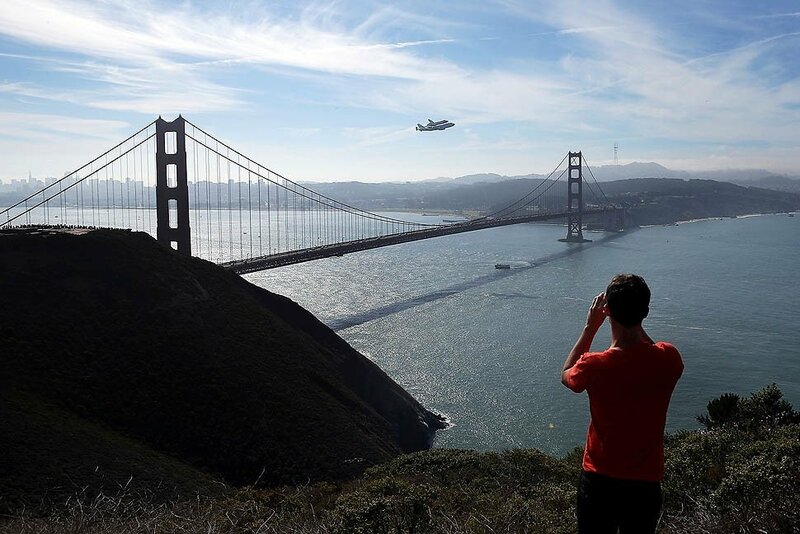 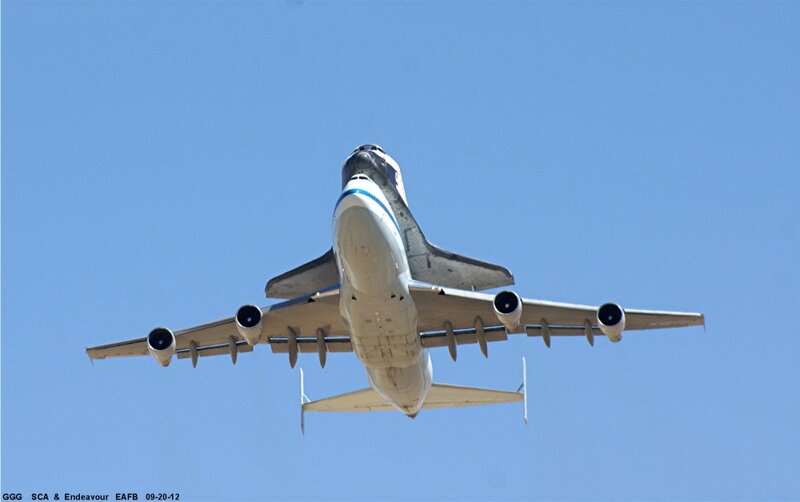 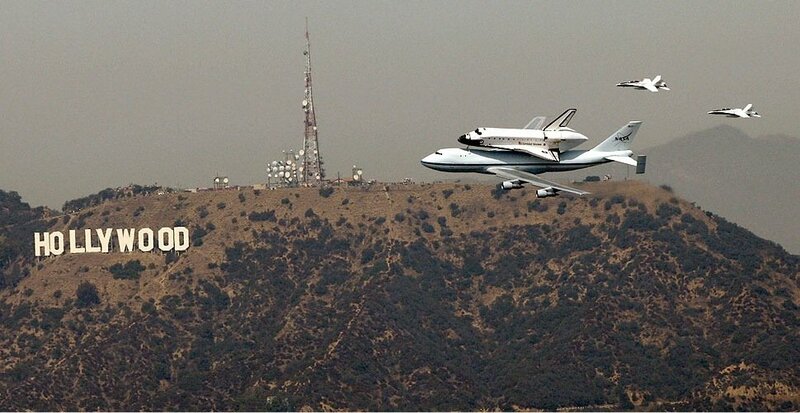 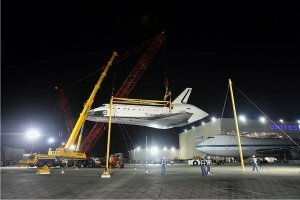 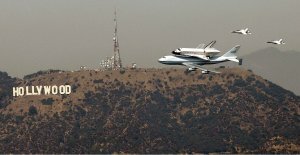 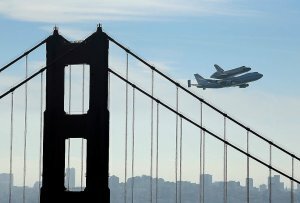 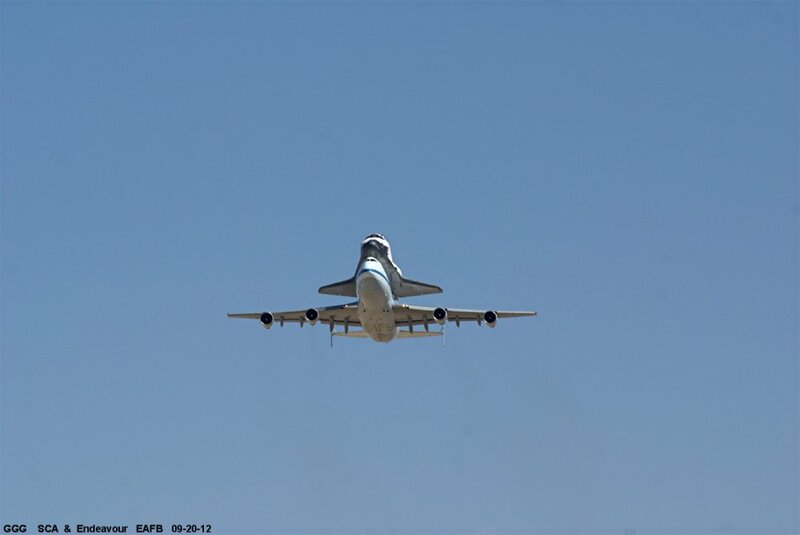 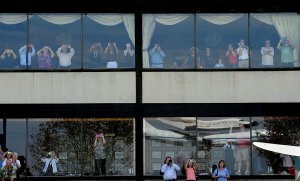 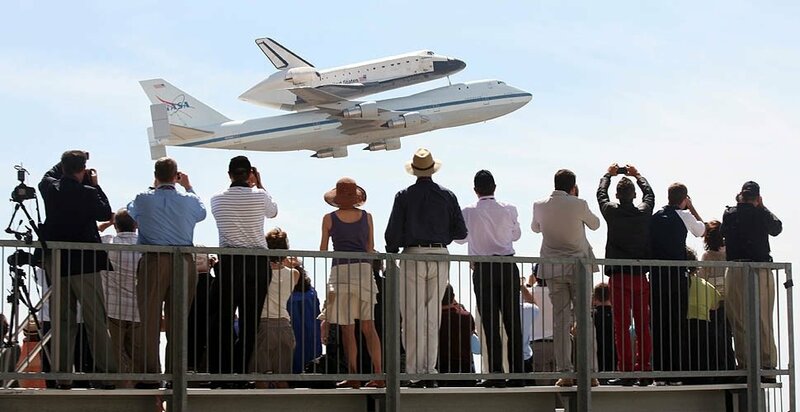 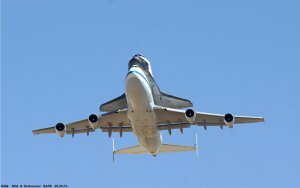 September 2012: The NASA / Boeing Shuttle Carrier Aircraft (SCA) and Space Shuttle Endeavour made a very low flyby at San Francisco and Los Angeles and then landed at LAX. 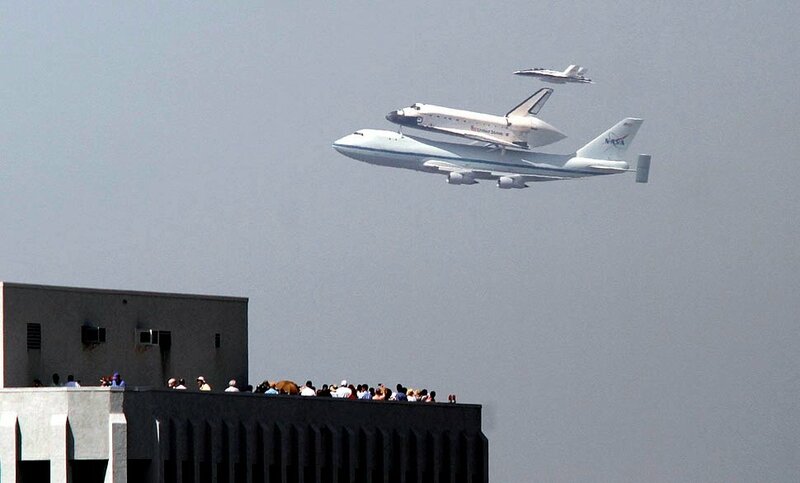 Some spectacular photography by unknown photographers. 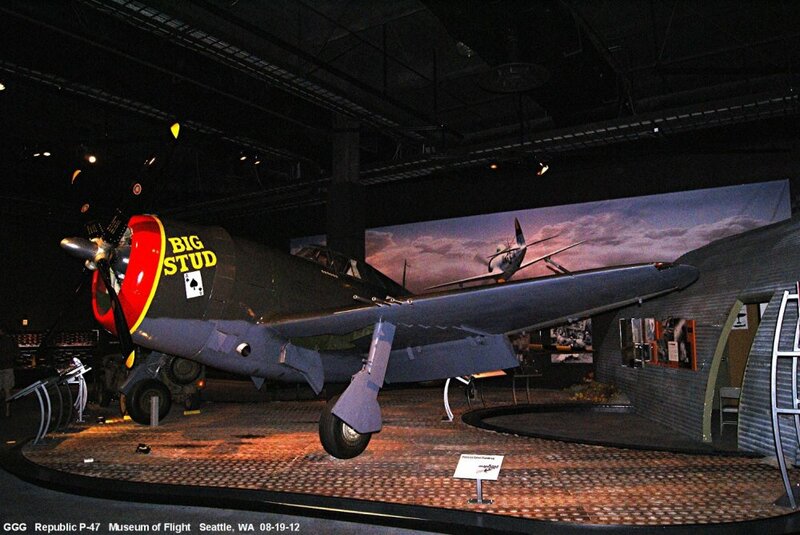 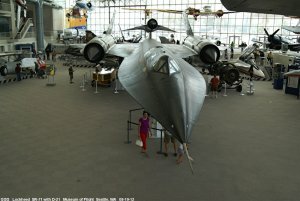 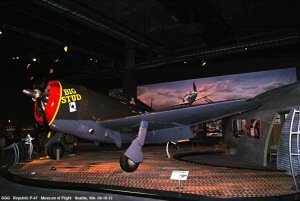 Along with the Smithsonian and the USAF Museum in Dayton OH, this is one of World's best. 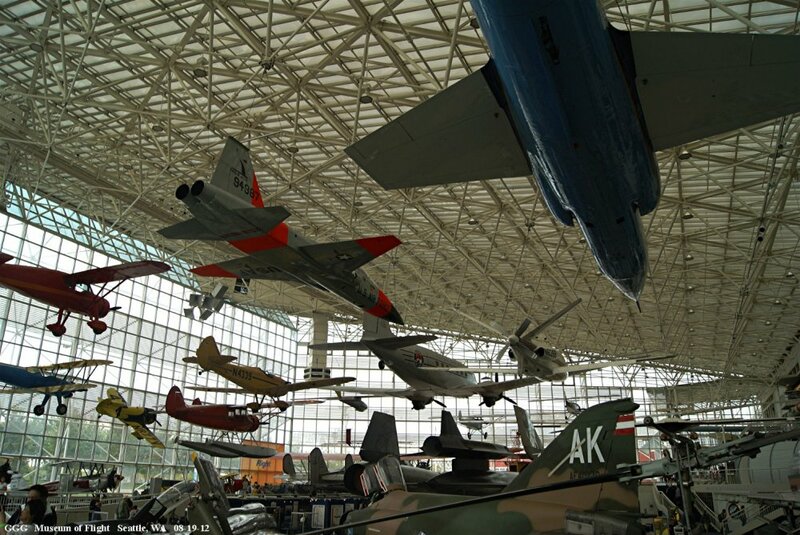 Attached are just a very FEW of the exhibits available.